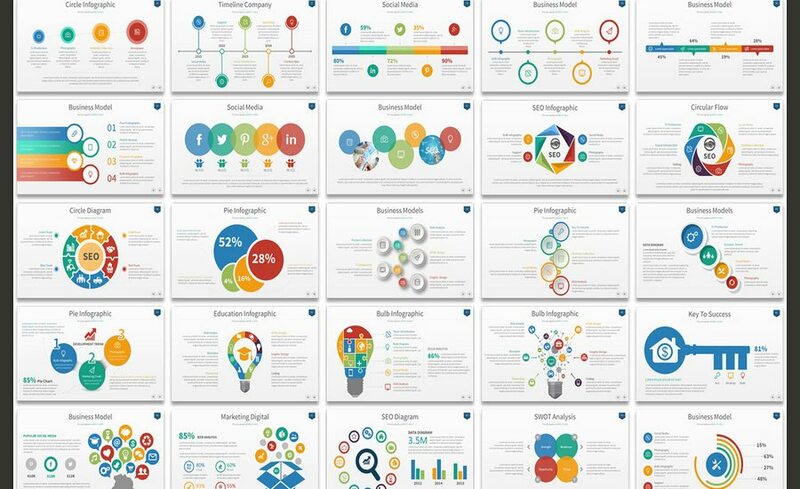 PowerPoint presentations, love them or hate them, are an essential part of today’s corporate world. 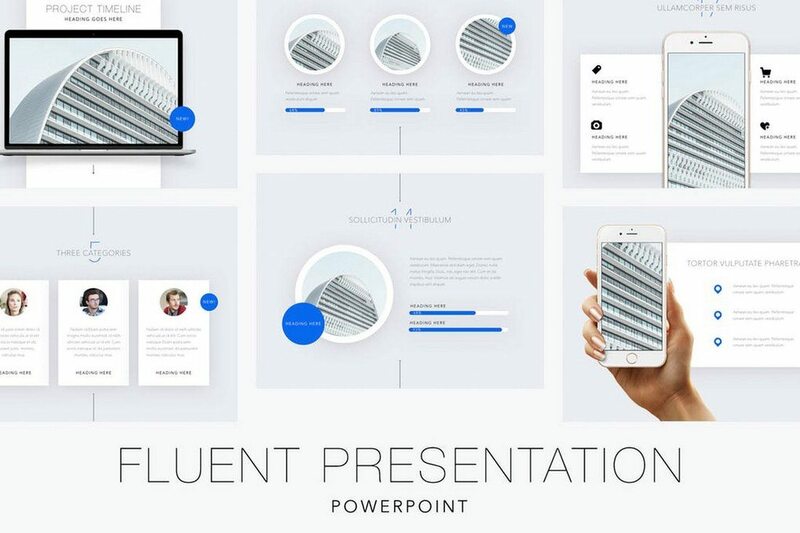 Whether for business use or design purposes, the look-and-feel of your PowerPoint presentation can make a tremendous difference in how impressively your pitch comes across. 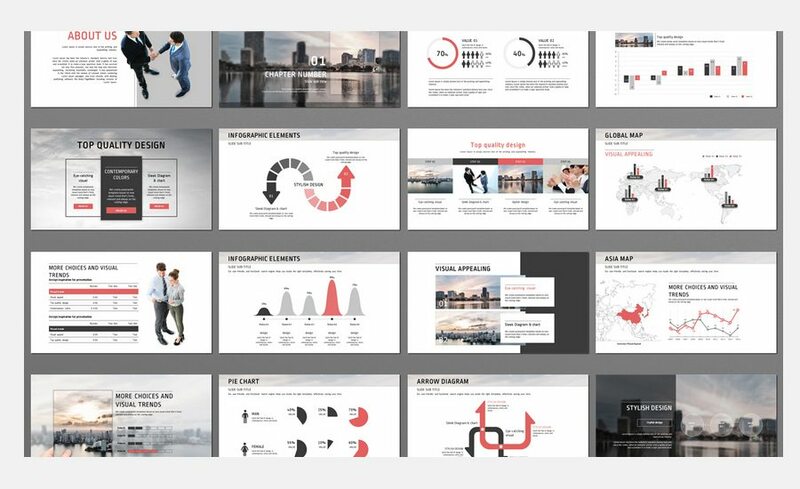 To help out with making your next PowerPoint presentation particularly impressive, we have searched the internet for professional and elegant PowerPoint templates that you can easily apply to your work. All these bundles contain fully editable slides and come at very affordable prices! 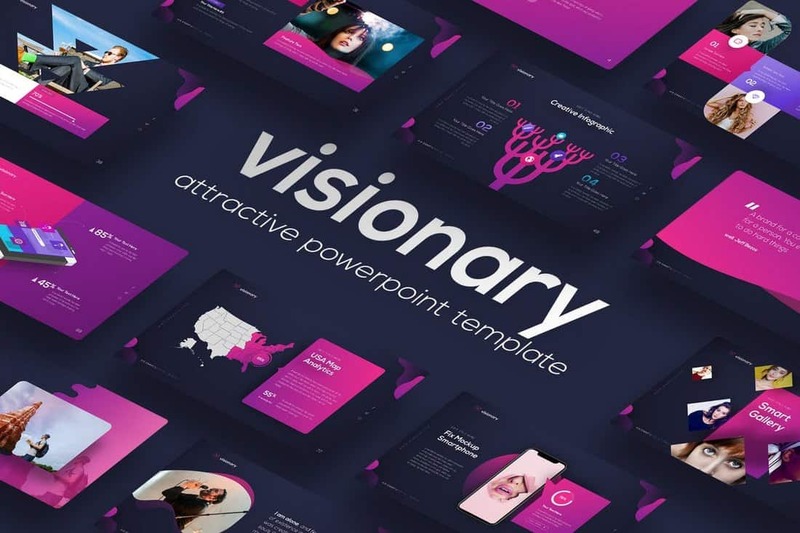 Visionary is a modern and beautiful PowerPoint template that comes with a colorful flat design. 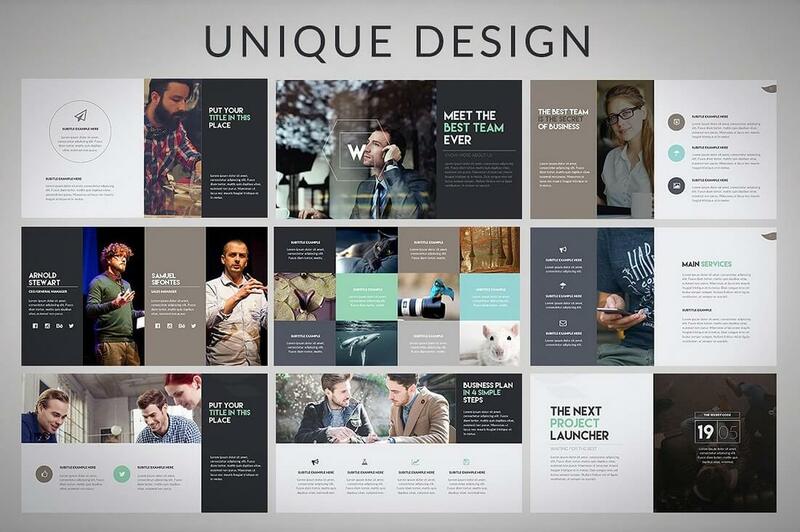 It includes 80 unique and animated slides featuring unlimited color options for customizing the design. The template also features an editable infographic and 98 master slide layouts. 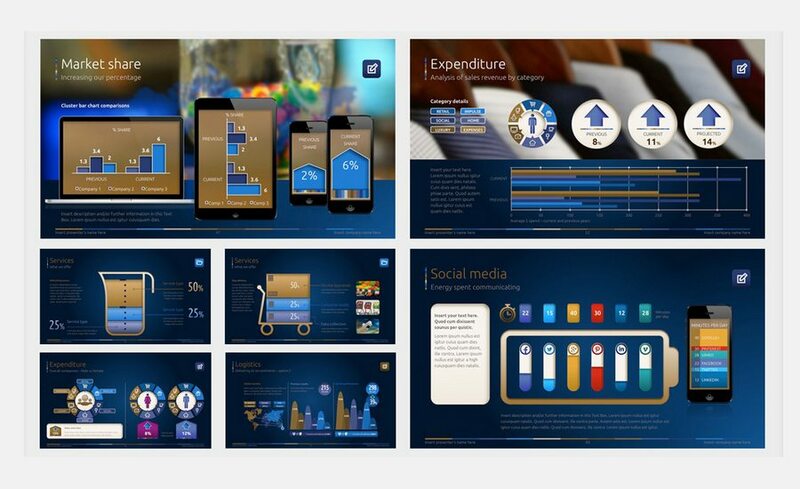 This premium PowerPoint template comes with a creative design most suitable for making presentations for agencies and creatives. 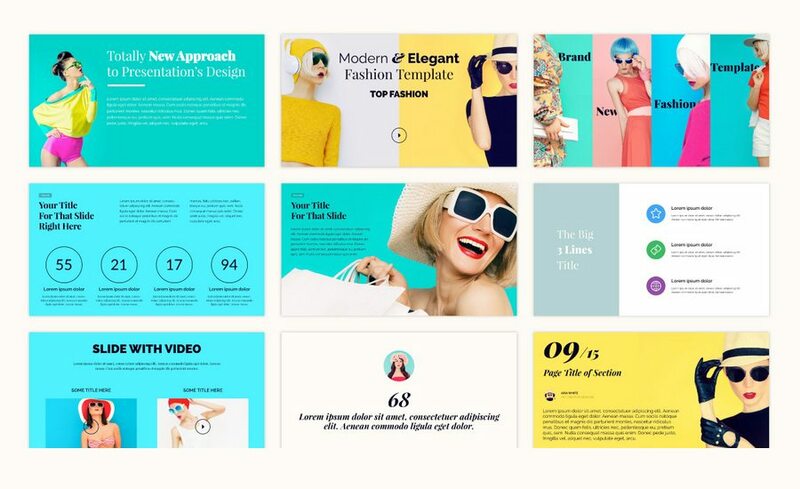 The template lets you choose from 25 unique slides, which are available in 5 different color schemes, to create attractive presentation slideshows. 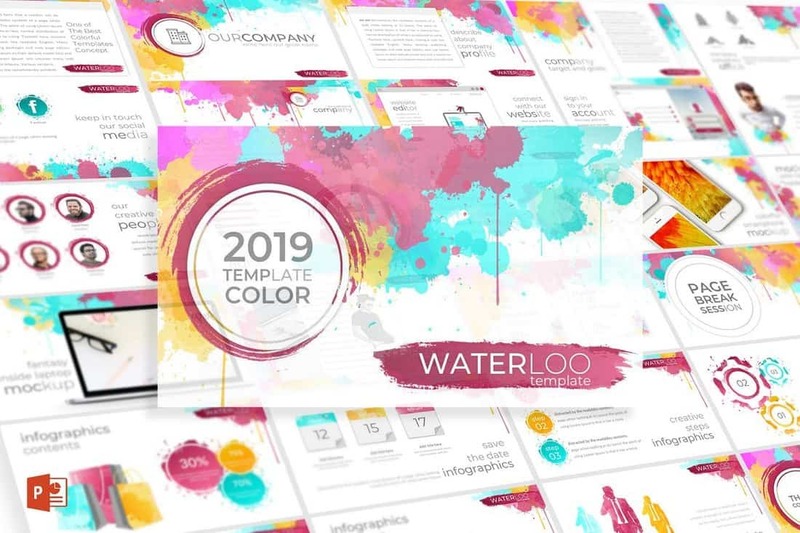 Waterloo is a unique PowerPoint template that comes with a set of slides that feature colorful watercolor designs. 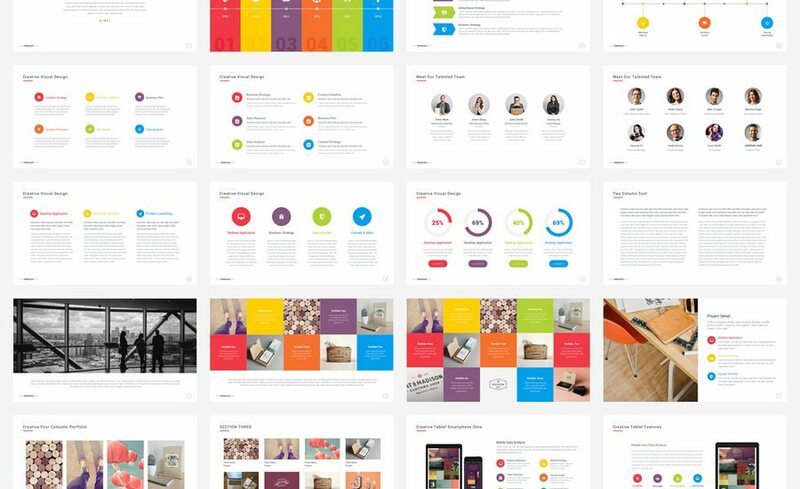 The template is available in 5 different color schemes and it includes a total of 150 slides. 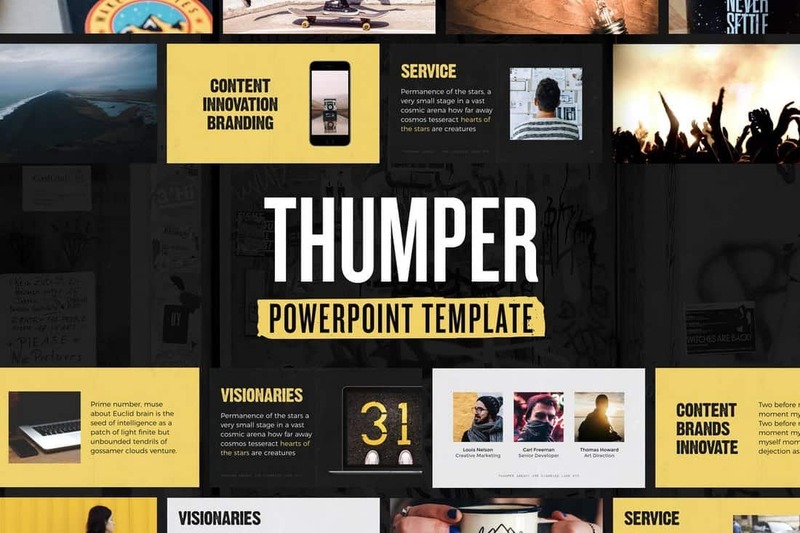 Thumper is a premium PowerPoint template featuring a highly visual design that allows you to showcase your brand and services with lots of images. It includes more than 100 unique slides that can be easily customized to your preference. This PowerPoint template comes with a modern design that will surely attract the attention of your audience. 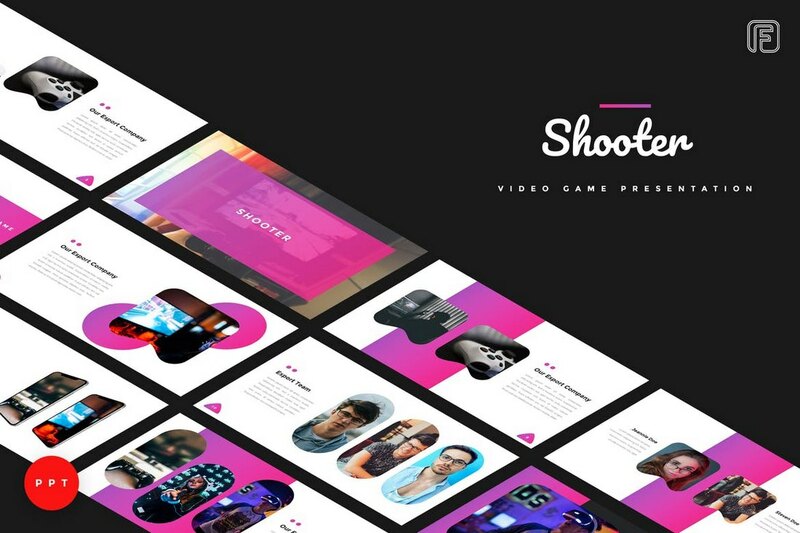 It features 30 unique slides in 5 different color variations filled with lots of visual elements such as colorful shapes, graphics, and image placeholders. 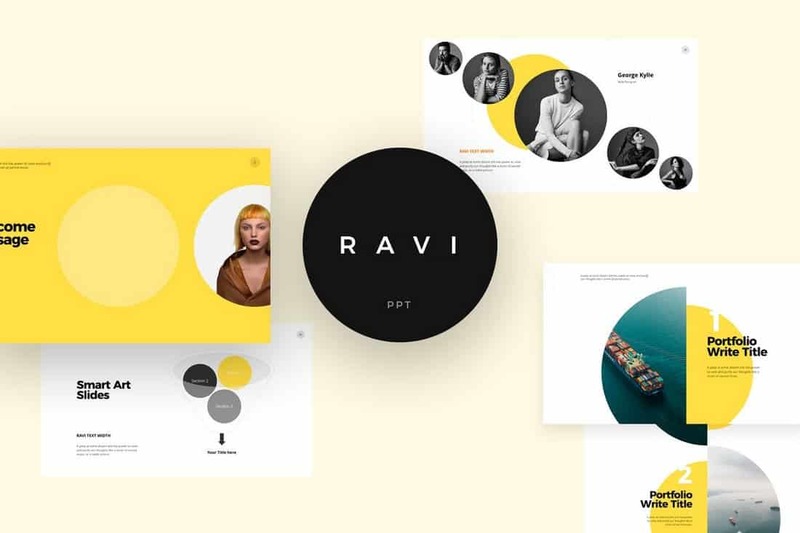 Ravi PowerPoint template features a minimalist design for making modern and elegant presentations for many different types of brands and businesses. It includes 100 unique slides in 40 different colors. 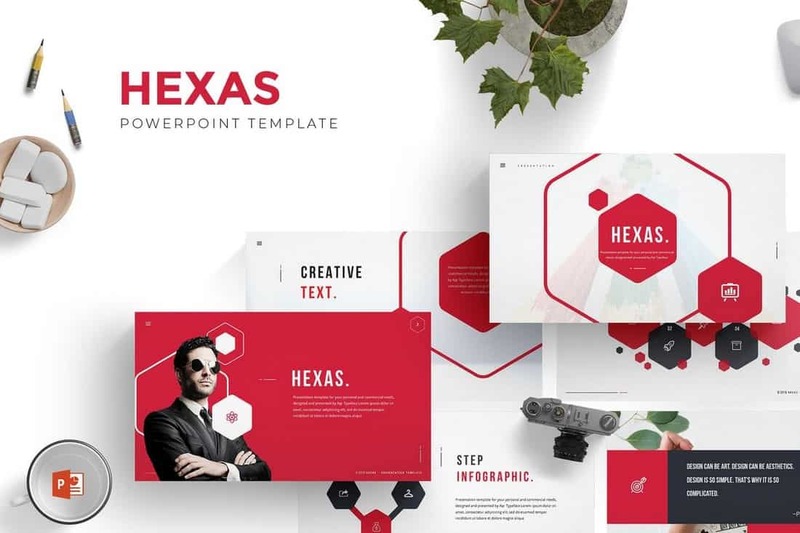 Hexas is a premium PowerPoint template you can use to make marketing and business-related presentations. It comes with 26 unique slides in 5 different color schemes, making it a total of over 120 slides. 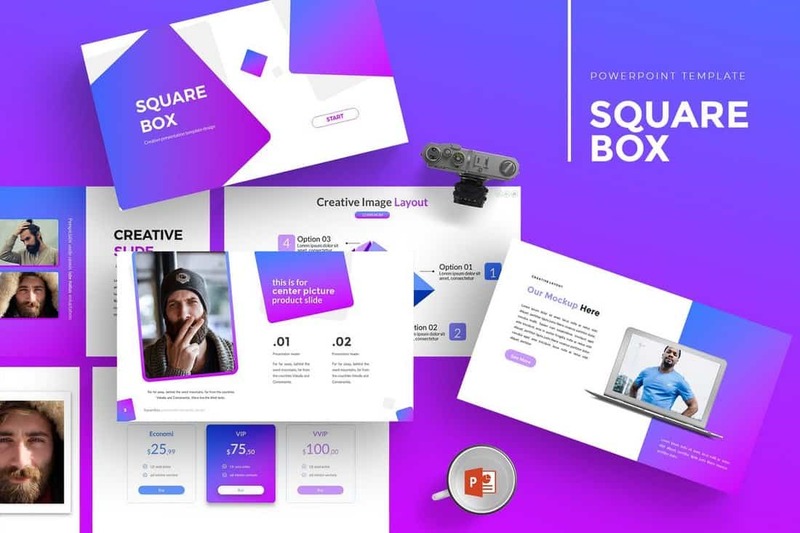 Squarebox PowerPoint template comes with a unique design of its own that will make your presentations stand out from the crowd. It features a total of over 150 slides with editable vector graphics, infographics, icons, and much more. 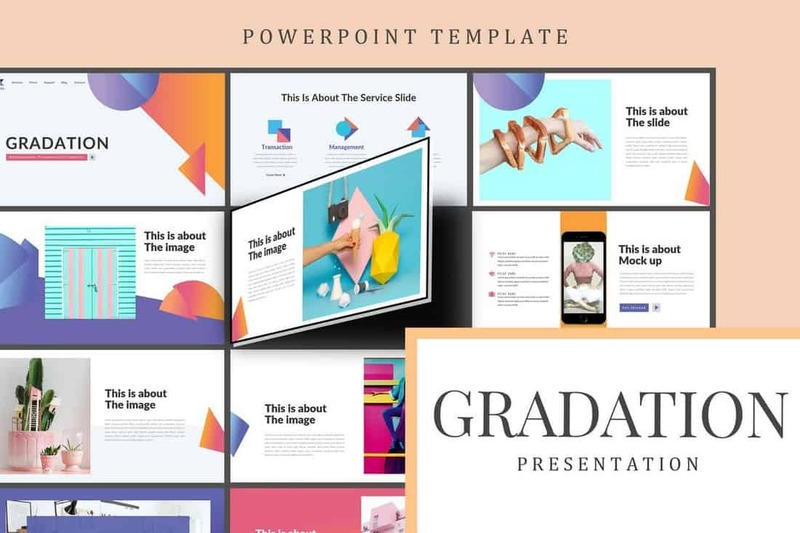 Gradation is a modern PowerPoint template featuring a colorful design filled with lots of gradients and shapes. It also comes with 50 unique slides that can be easily customized to your preference. 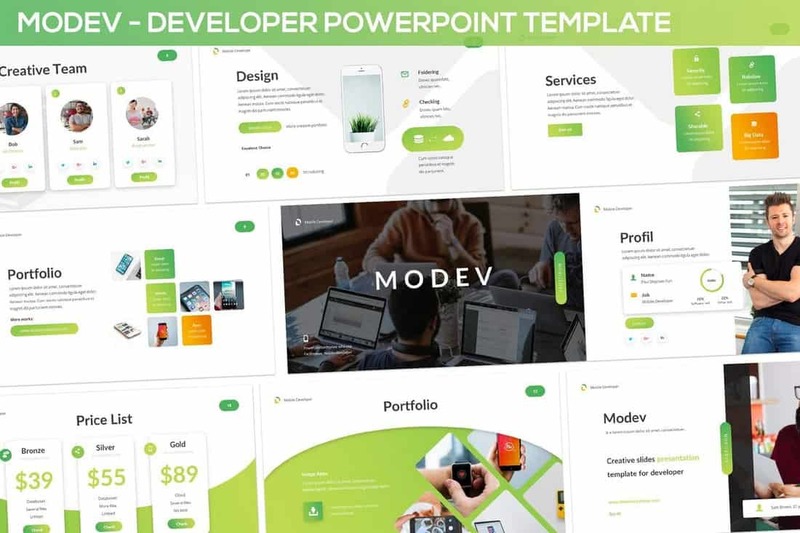 Modev is the perfect PowerPoint template for making professional presentations for agencies and corporate businesses. You can choose from 30 unique slides in 3 premade color schemes to customize the template as well. 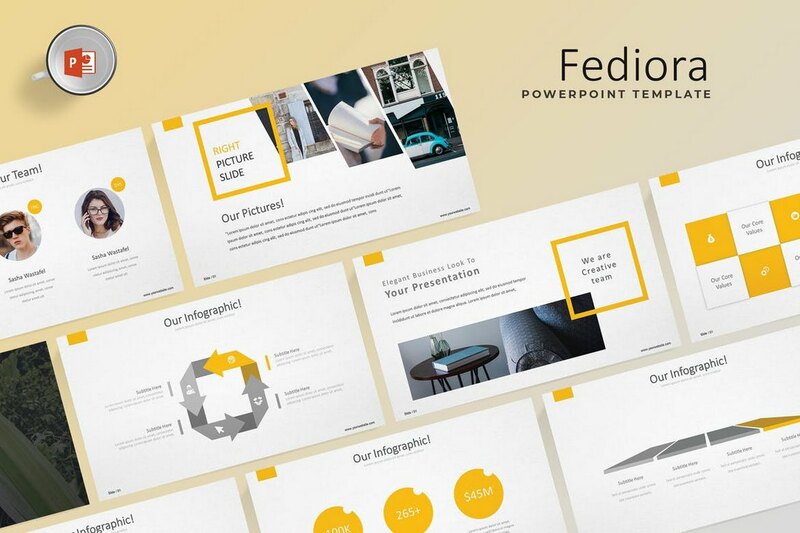 Fediora is an elegant and minimal PowerPoint presentation template that features a creative design filled with stylish shapes and colors. 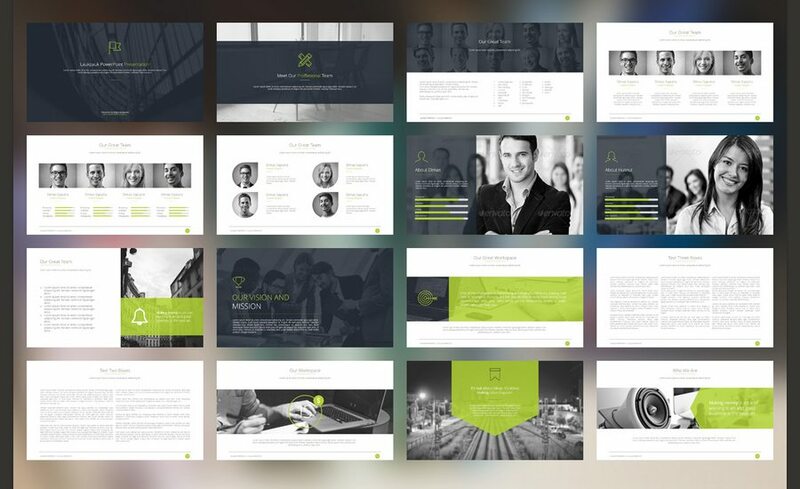 The template includes 30 unique slides that are available in 5 different color schemes, making a total of 150 slides. 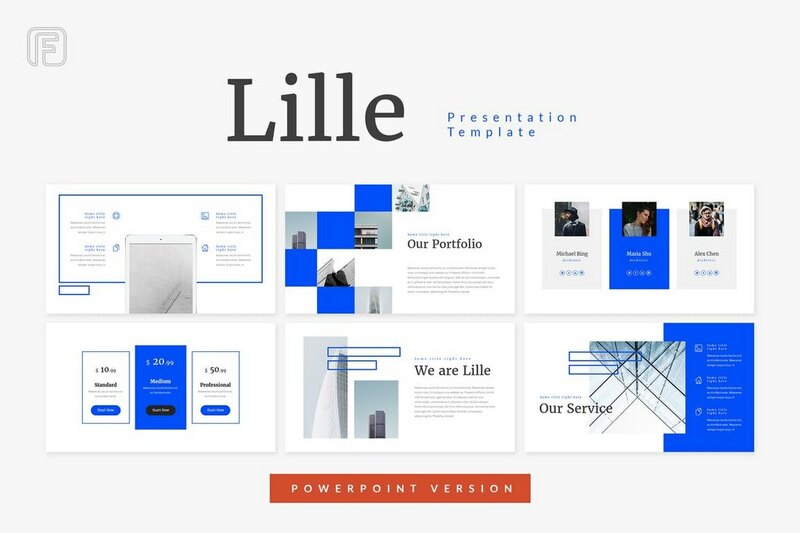 Lille is a minimalist PowerPoint presentation template featuring 30 unique slide designs. It’s ideal for making presentations for personal, creative, and professional slideshows, especially related to architecture and design. 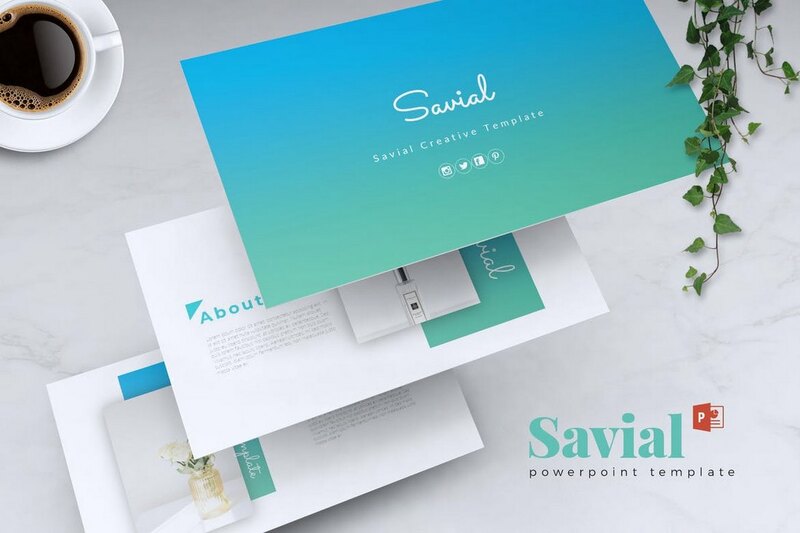 Savial is a modern PowerPoint presentation template that also includes 30 unique slides. 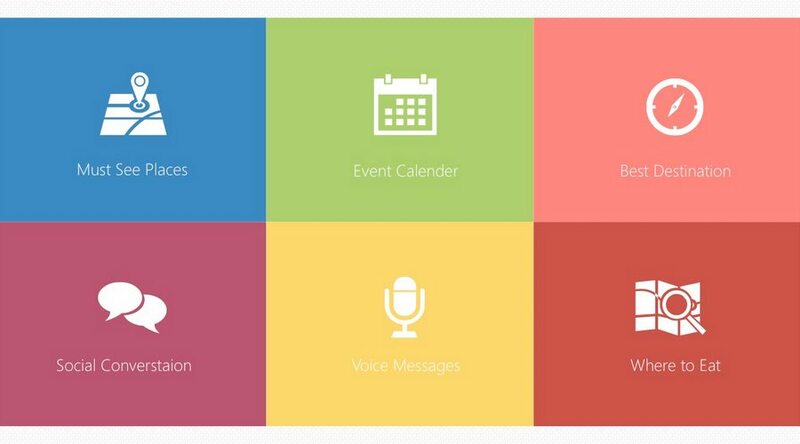 It allows you to choose from 5 variations of color themes to craft presentations related to all sorts of topics. 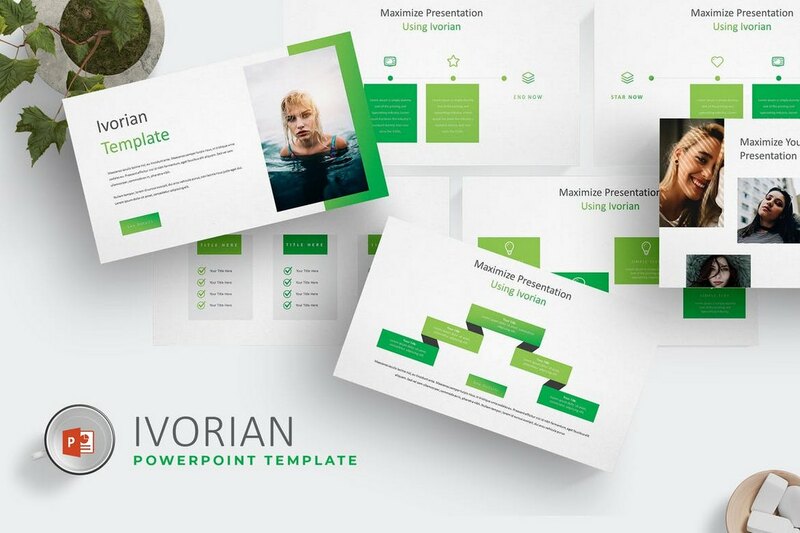 Ivorian is a corporate and business PowerPoint presentation template that includes a total of 150 slides with lots of graphics, pricing tables, charts, and more. The template is available in 5 different color schemes as well. 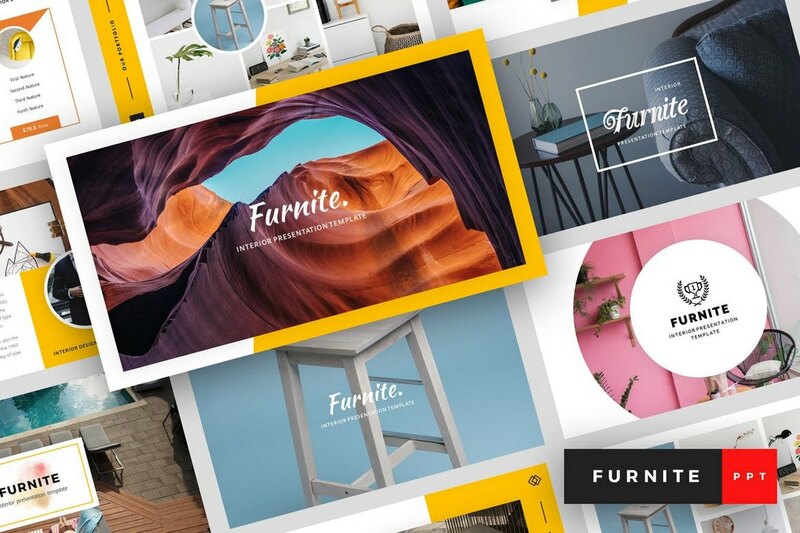 Furnite is a highly visual PowerPoint presentation template that comes with 24 unique slides that use lots of images throughout its design. This makes this the perfect template for making presentations related to design, art, and photography. Just as the name suggests, this PowerPoint template is crafted specifically for making presentations related to business and corporations. 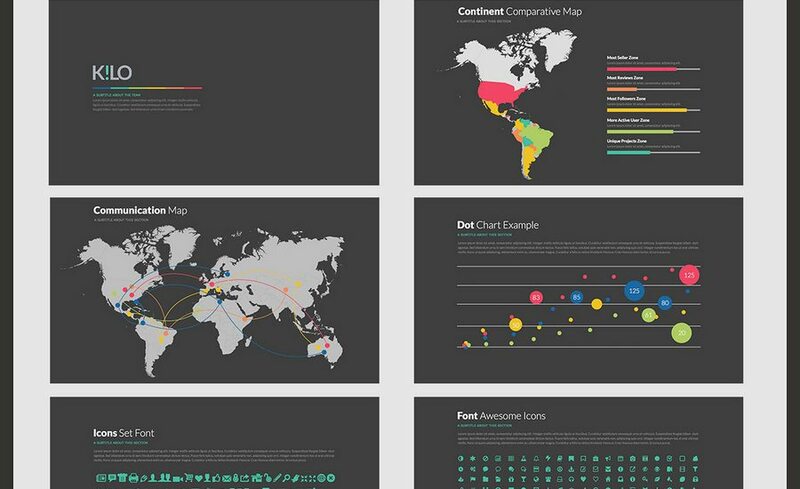 It includes 50 unique slides featuring custom infographics, vector elements, icons, and more. 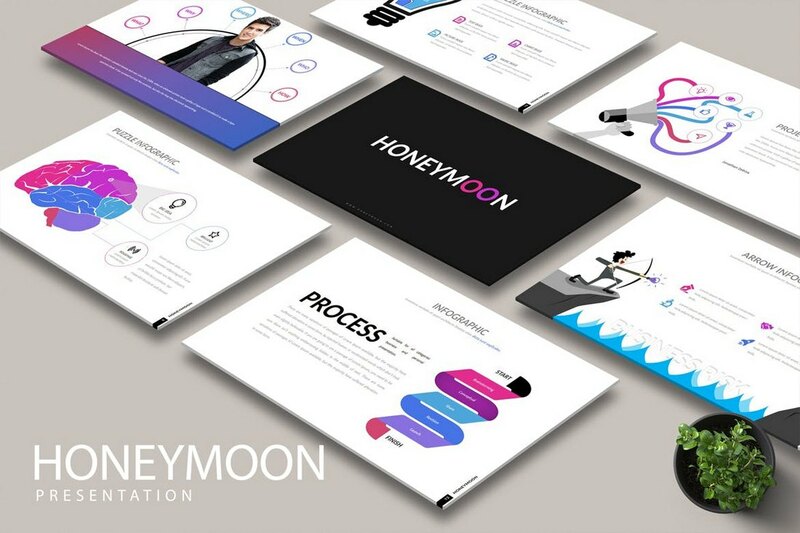 Honeymoon is quite an odd name for this PowerPoint presentation template because it has nothing to do with weddings or marriages. 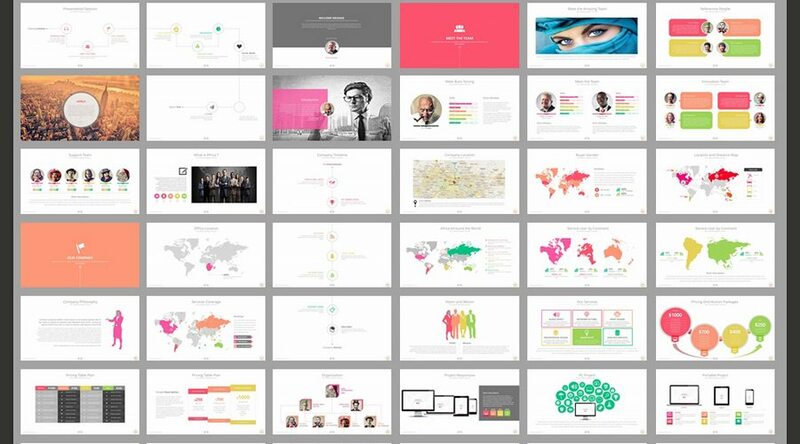 The template includes 30 slides featuring modern designs for crafting business and professional presentations. Gabrielle is a stylishly unique PowerPoint presentation template that comes with an unordinary design. 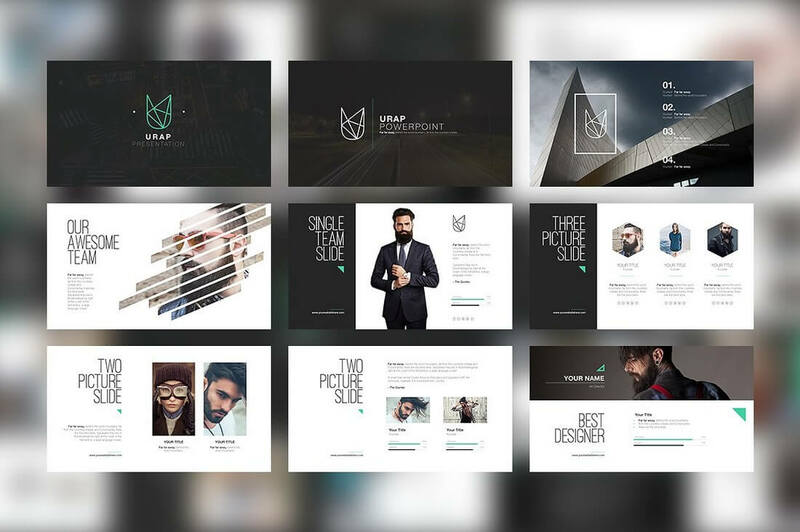 The template comes with 50 unique slides that feature creative designs ideal for fashion and clothing brands. 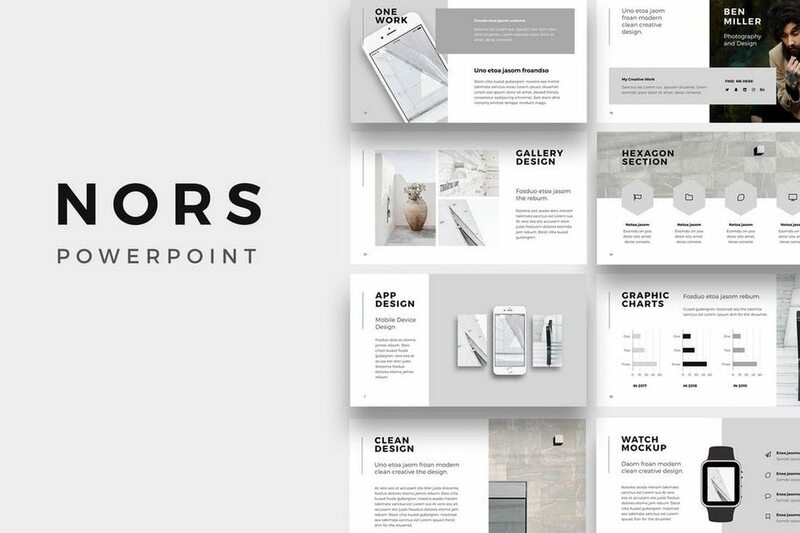 This minimalist PowerPoint presentation template is perfect for making slideshows for startup and corporate presentations. 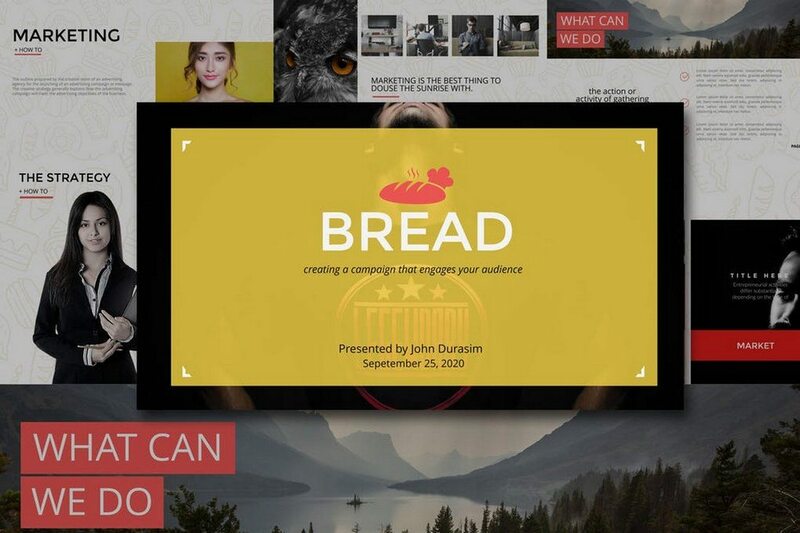 It includes 50 unique slides with fully editable designs, text, and image placeholders. 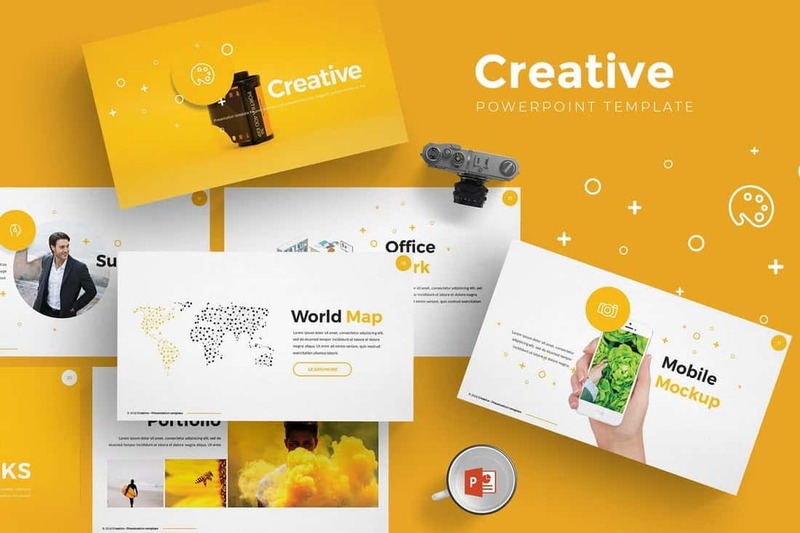 Shooter is a creative PowerPoint presentation template that comes with a modern design filled with shapes, graphics, and images. It’s most suitable for making presentations related to gaming but you can customize the slides to fit other topics as well. 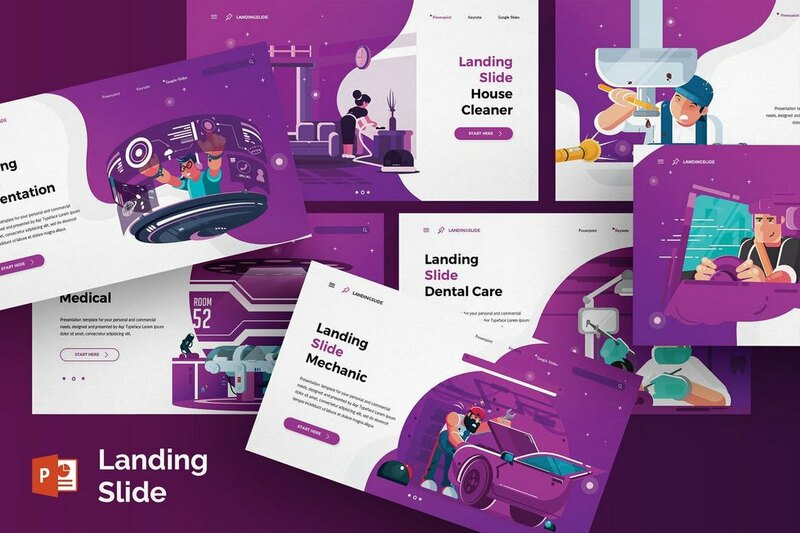 Landing Slide is a beautifully illustrated PowerPoint template that you can use to create many different types of slideshow presentations, including for startups, marketing, and corporate businesses. The template comes with a total of 50 slides in 5 different color schemes, all filled with gorgeous and creative illustrations. 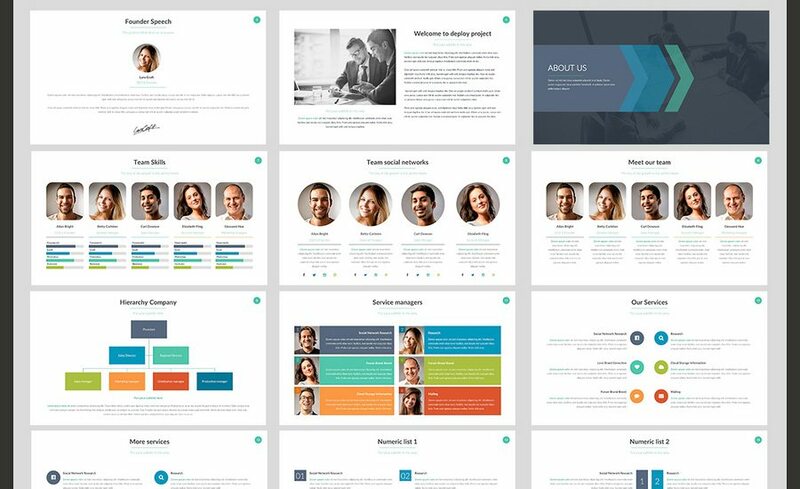 This PowerPoint presentation template is made specifically for making slideshows for showcasing company profiles. 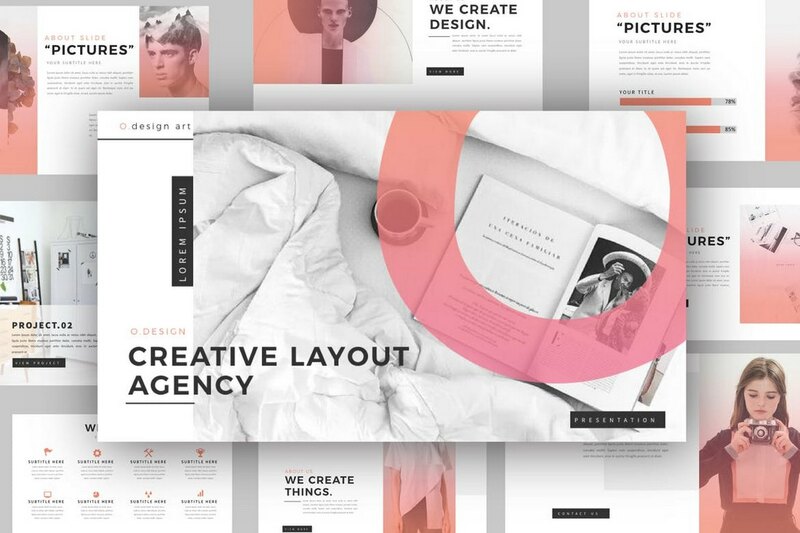 The template comes with 30 unique slides in 5 premade color schemes. The slides in this template also feature customizable vectors, image placeholders, infographics, charts, graphs, and more. 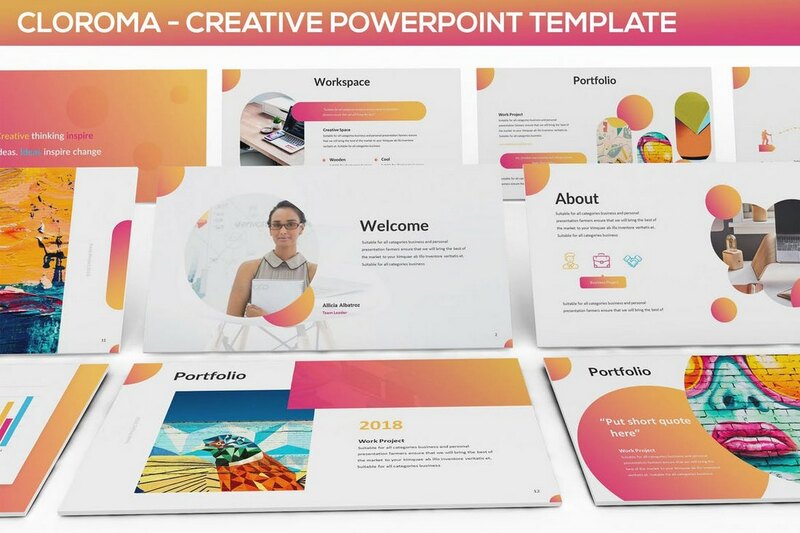 This colorful PowerPoint template is perfect for creating a presentation for a creative agency, a freelancer, or a professional. The template includes a total of 1200 slides in multiple color variations and comes in both widescreen and standard sizes. 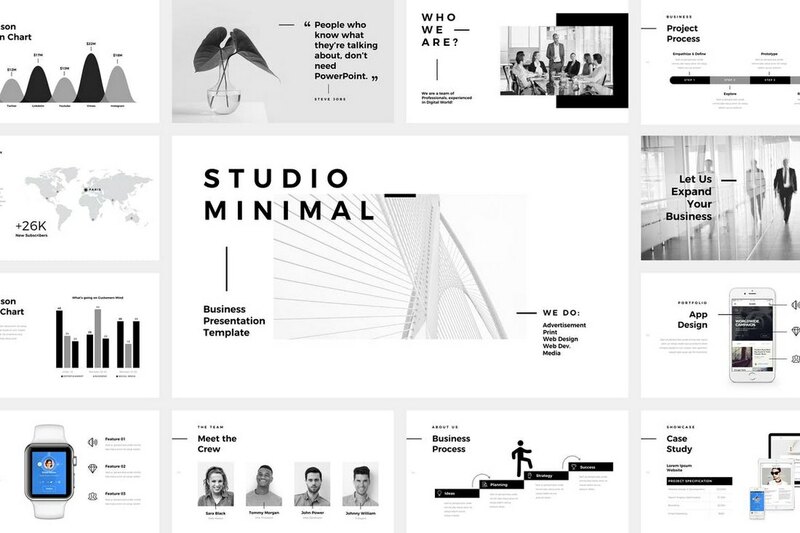 A highly minimalist PowerPoint presentation template featuring a clean design. This template comes with 120 unique slides filled with attractive transition and object animations. The template also includes a set of custom line icons and editable vector graphics. 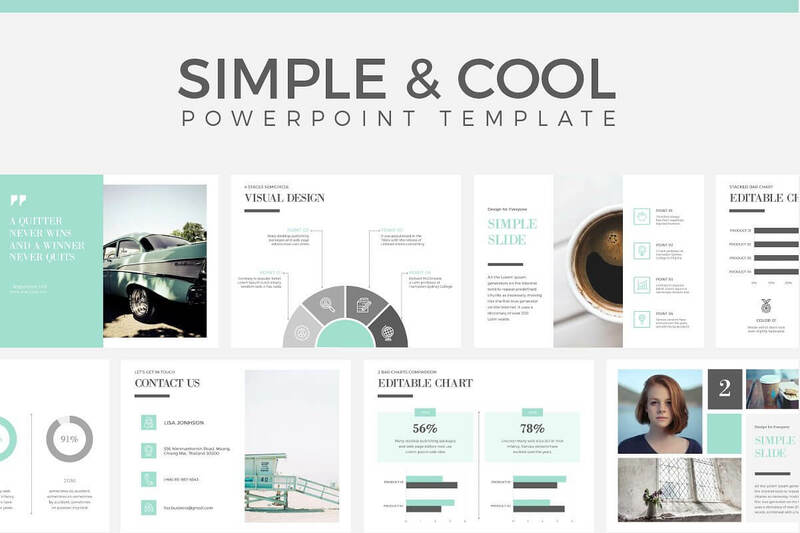 If you’re a creative freelancer or an agency, this PowerPoint presentation template will help you create more engaging slideshows to attract new clients. 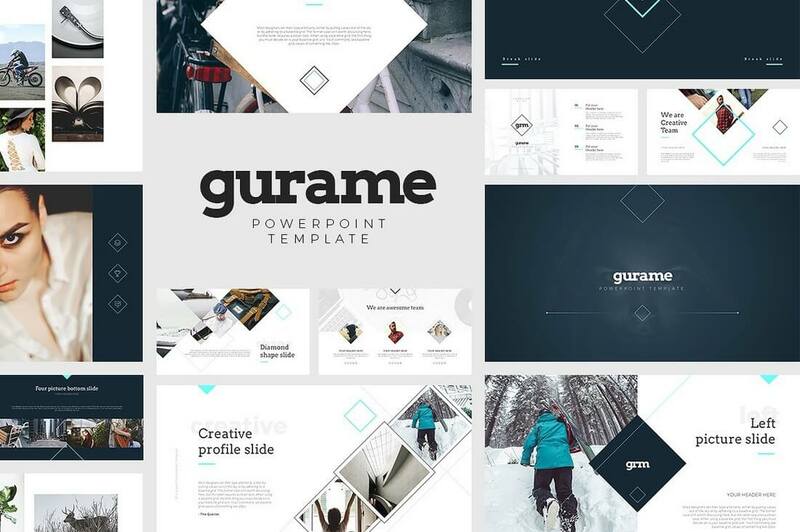 This template comes with more than 50 unique slides featuring customizable colors, editable vector graphics, infographics, and more. 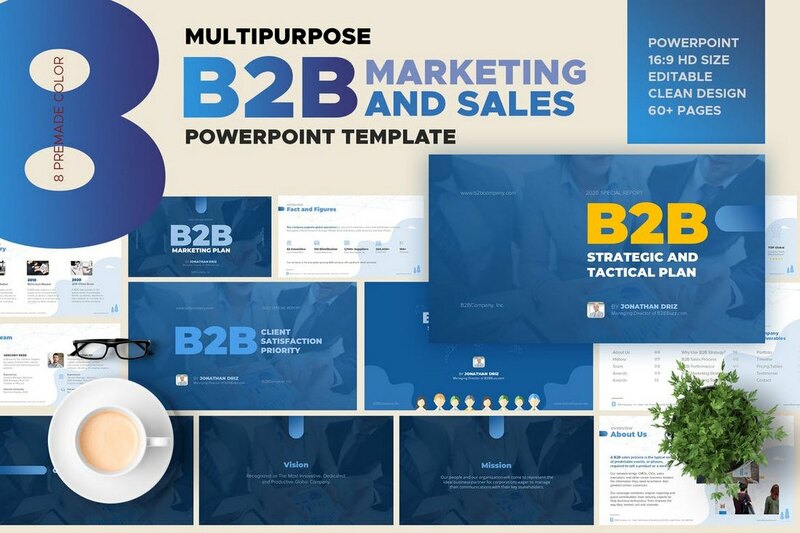 This PowerPoint presentation template is designed specifically for B2B marketing and sales presentations. It comes with 60 unique slides featuring modern, colorful designs, and with lots of vector graphics, charts, infographics, and illustrations. The template also supports unlimited color options as well. 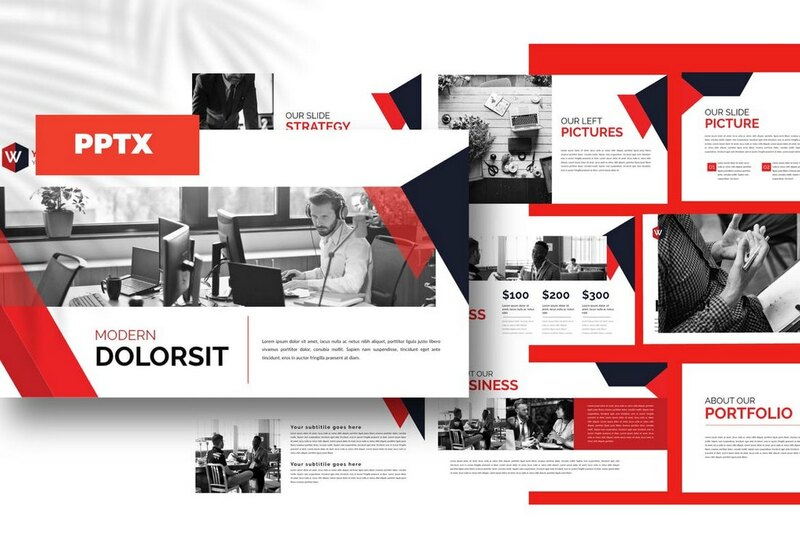 This is a colorful PowerPoint template that you can use to create an attractive presentation to instantly grab the attention of your clients. The template features 70 unique slides in HD resolution. It also includes thousands of icons, vector graphics, shapes, and lots of color schemes to choose from. A PowerPoint presentation template with 100 unique slides in both light and dark versions. This template also features a modern design style that will add more value to your presentations. 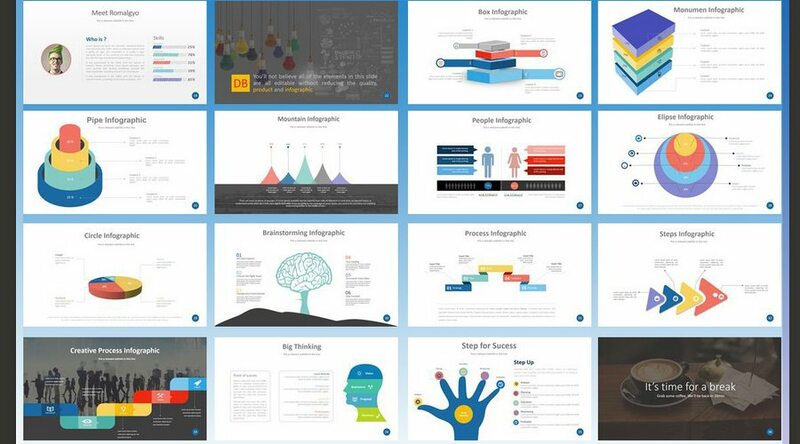 In addition, the slides include infographics, icons, diagrams, charts, and lots more. This template is ideal for your marketing and promotion related presentations. It comes with 120 slides in HD resolution and featuring slides in clean and dark color themes. The slides also feature customizable charts, maps, and infographics. 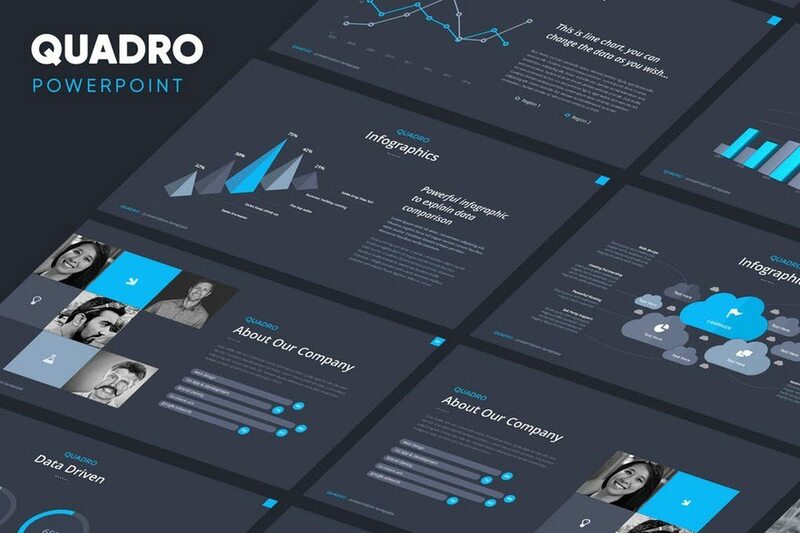 Featuring a flat design inspired slides, this PowerPoint template is simply perfect for creating presentations for web design firms, creative agencies, and more. The template includes 110 unique slides with lots of graphics and elements. 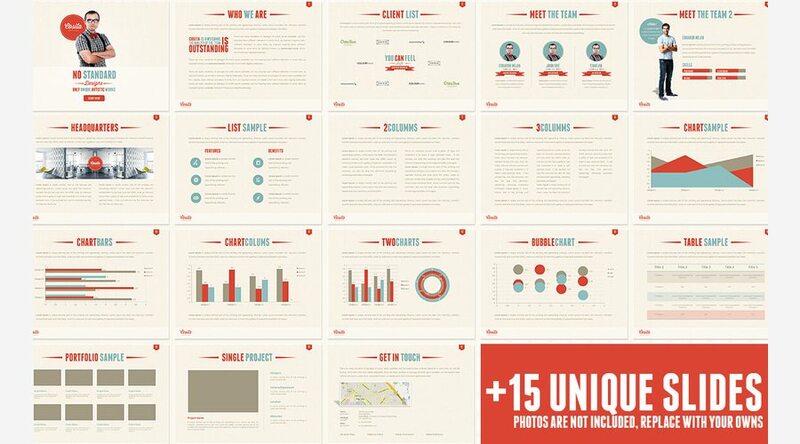 The proper use of the color red makes this PowerPoint template stand out from the crowd. You can use it to create presentations for corporate businesses, agencies, and more. 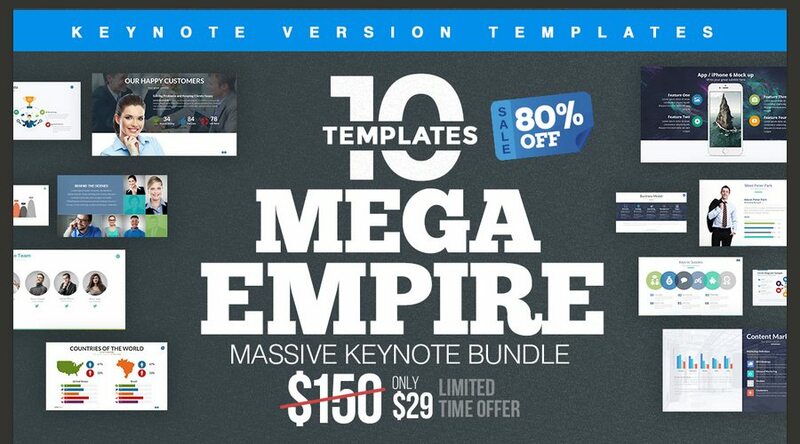 If you’re using a Mac computer, there’s also a Keynote version of this template as well. 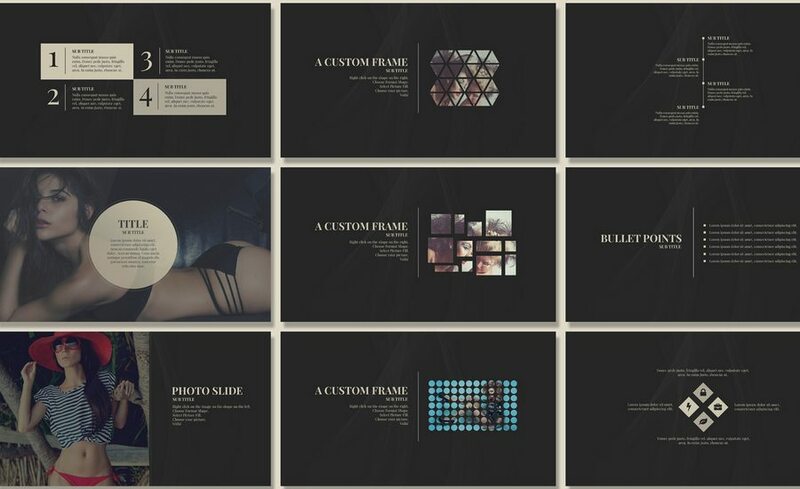 Another elegantly designed PowerPoint template for creating marketing related presentations. This template comes with a set of unique slides featuring a clean design. All the graphics and elements in the slides are also fully customizable so you can easily edit them to fit your preference. 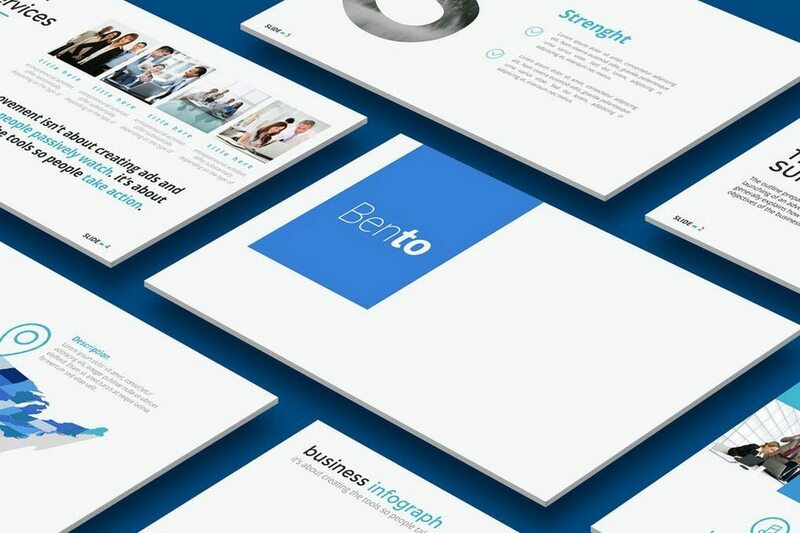 Benton is a popular PowerPoint template that’s mostly suitable for creating slideshows and presentations for corporate businesses and for product promotions. 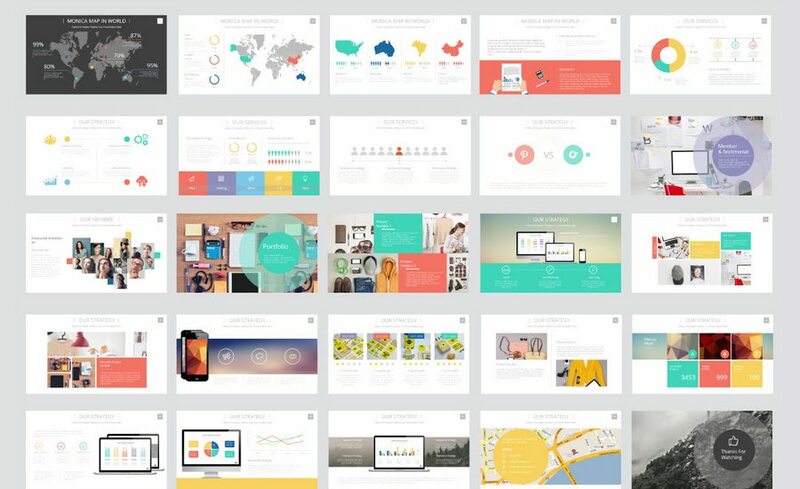 The template includes 80 unique retina-ready slides with custom icons, graphics, and more. 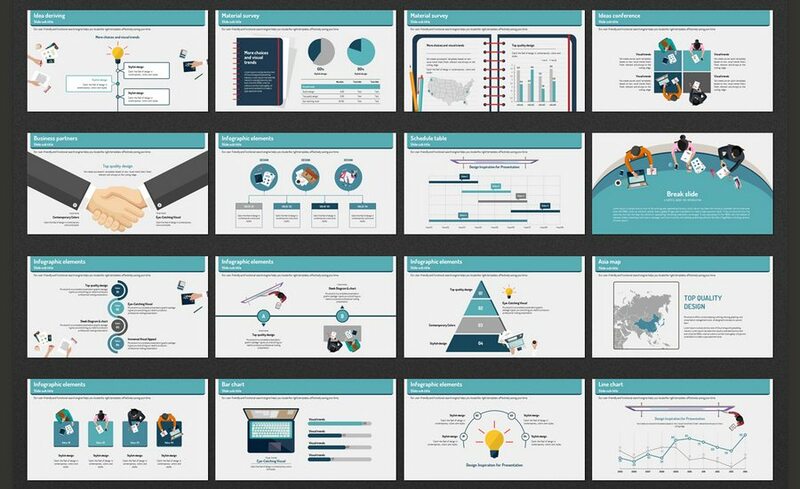 Talk about sales and your sales projections in your next marketing meeting using this PowerPoint template. 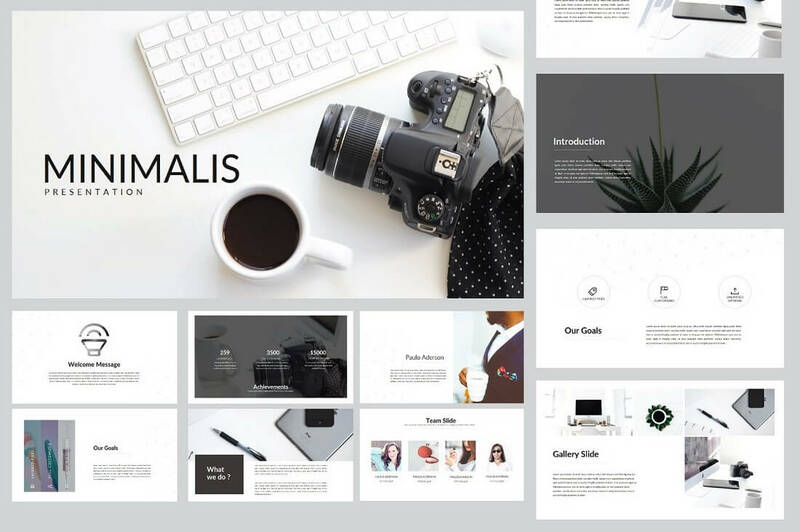 You can create a stylish and minimalist slideshow using this template, which comes with slides designed for creating sales related presentations. Another minimalist PowerPoint template featuring 170 unique slides. 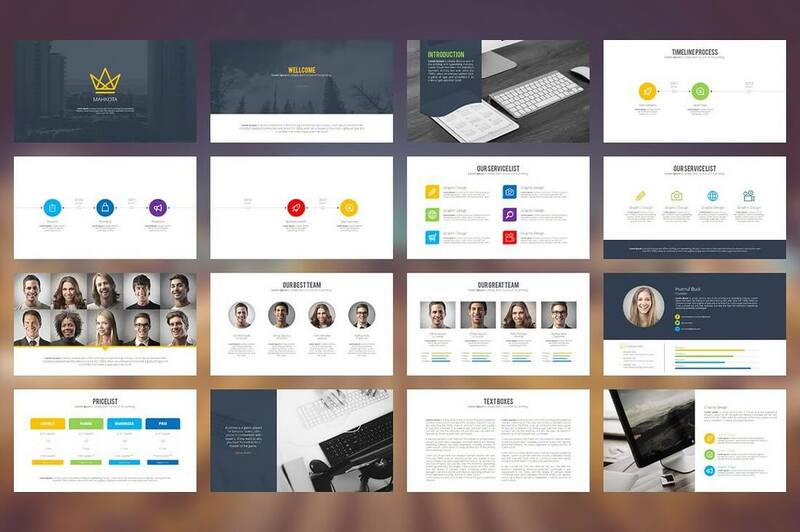 This template can be used to create slideshows and presentations for many different types of businesses and occasions, including eCommerce, investing, real estate, and more. 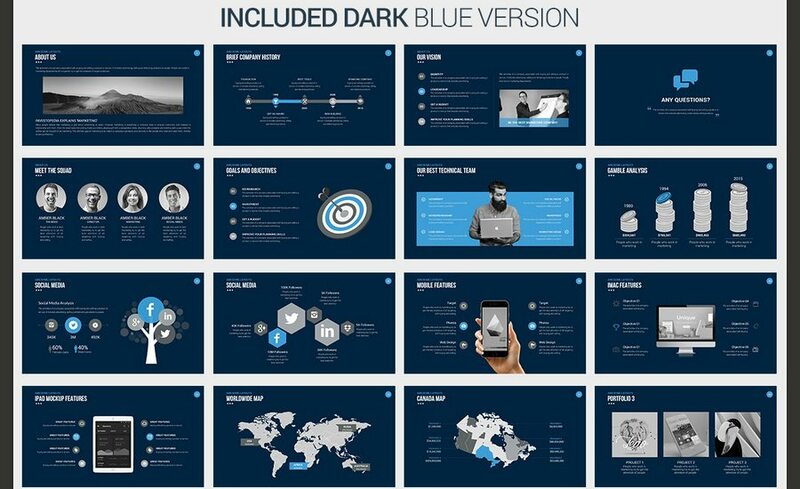 If you’re looking for a PowerPoint template to promote a high-end product or a service, it’s best to use a presentation with a darker theme. That’s what makes this template perfect for that job. It comes with more than 80 unique slides in 4 pre-made themes. Nors is yet another presentation template the uses the elegance of minimalism to make your slideshows look even better and more attractive. 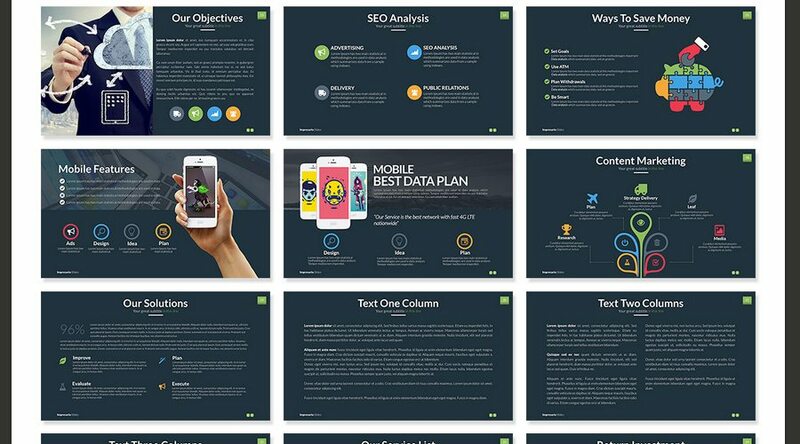 The template features over 130 unique slides with hundreds of icons, graphics, charts, and more. This PowerPoint presentation is ideal for showcasing and presenting real-estate and property related services. It can also be used to promote many other types of businesses as well. 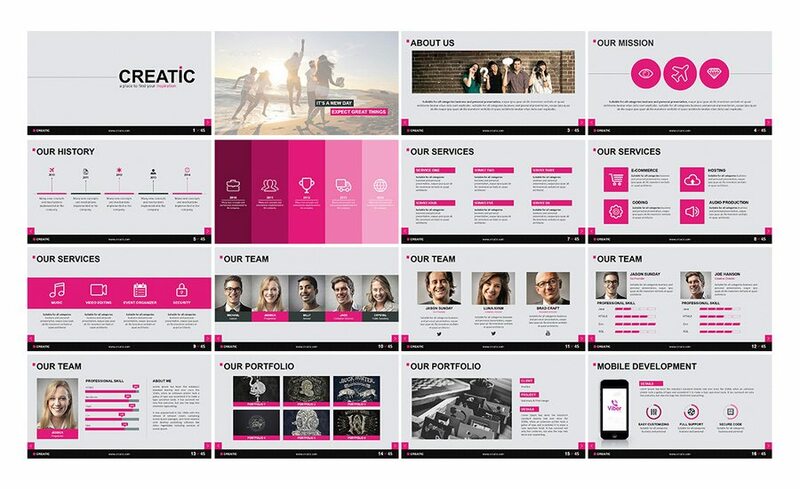 This colorful and attractive template can be used to craft effective presentations for your inhouse team meetings and even client presentations. 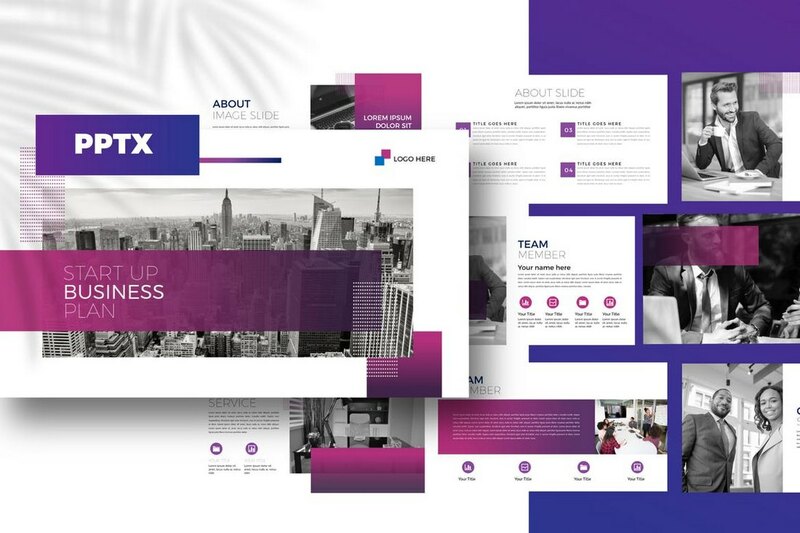 The slides of the template features a modern design that quickly attracts anyone’s attention. 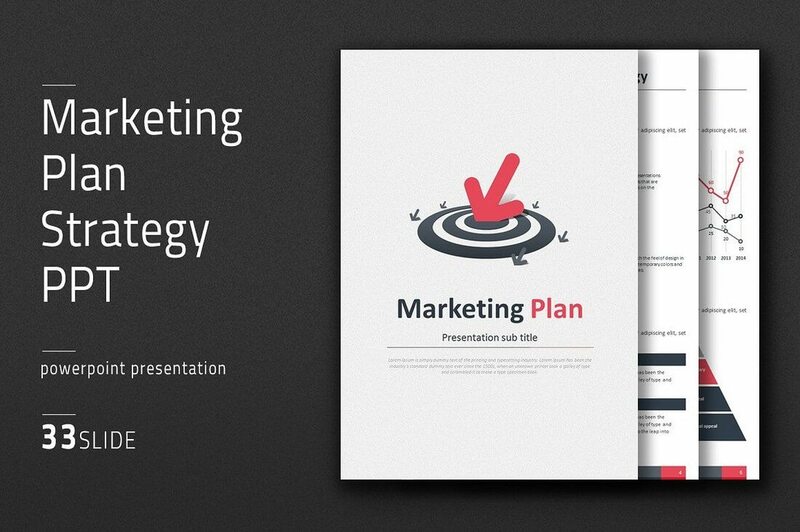 An effective PowerPoint template that you can use to create any type of a marketing related presentation. It also has a design that makes it a great choice for creating investor pitch decks and slideshows as well. 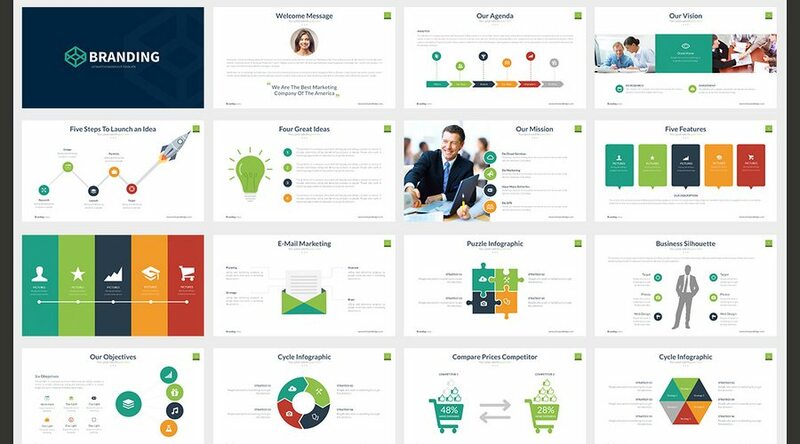 This multipurpose Powerpoint templates bundle comes with 10 different templates that can be used for various business, investment, and startup presentations. The bundle includes hundreds of unique slides in 24 color themes, infographics, charts, tables, and much more. 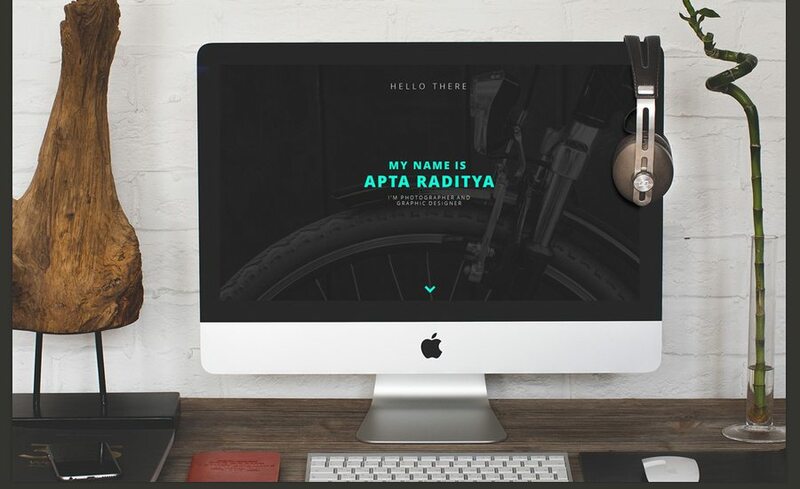 For creating presentations with a minimalist design, this template is simply perfect. It comes with 36 easily customizable slides, charts that are compatible with Excel, graphics, free fonts, and much more. 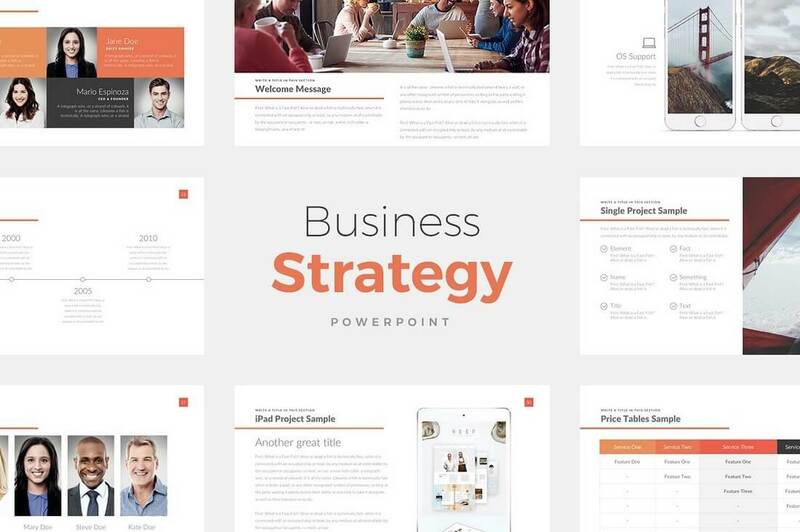 This Powerpoint template is more suitable for creating presentations for your business strategy meetings and growth plans. It includes over 60 unique slides in 24 color themes. 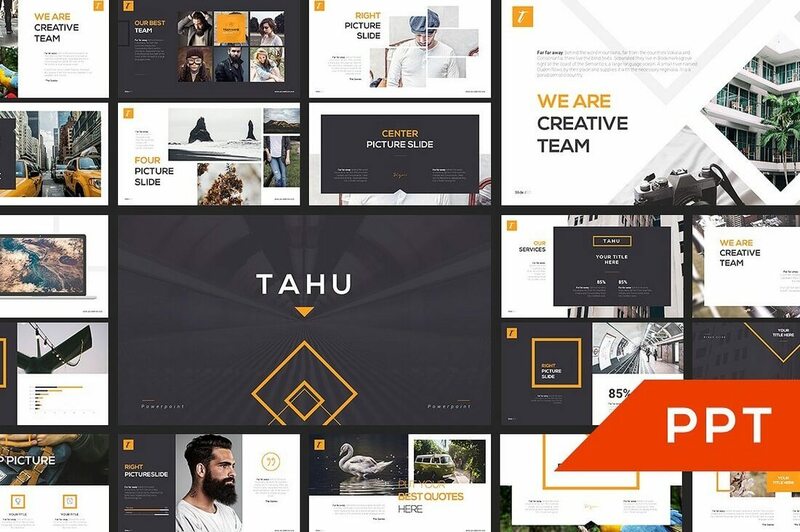 TAHU is a unique Powerpoint template that comes with over 50 slides and unlimited color options. Its selection of pre-designed color schemes makes it most appropriate for marketing related presentations. 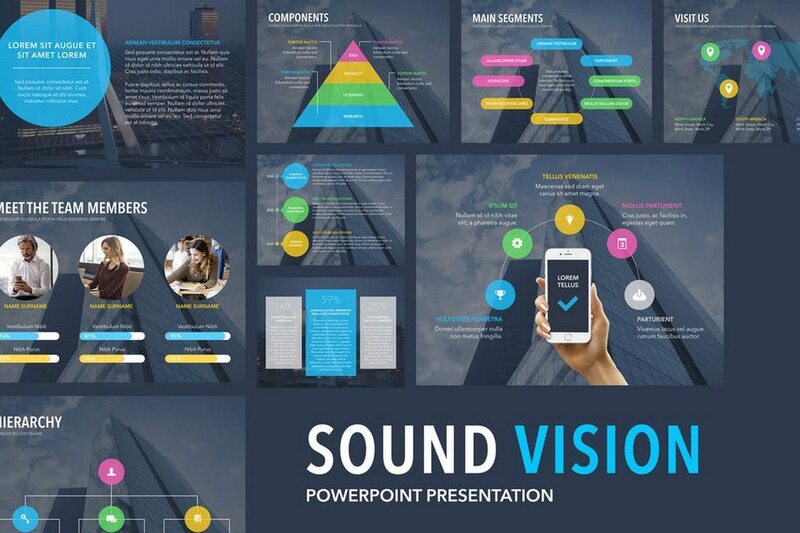 A modern and minimal Powerpoint template that brilliantly use photos to attract attention to the presentations. It comes with 63 slides and 450 vector icons. 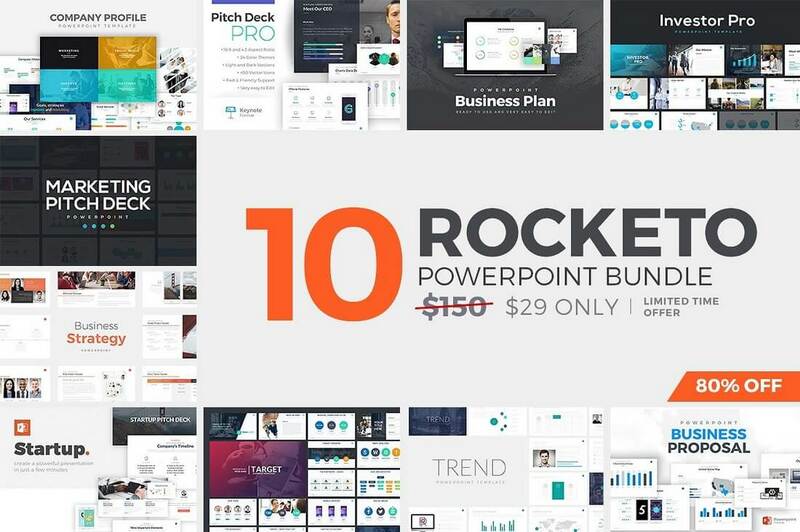 This bundle includes 10 Powerpoint presentations that feature over 6,000 slides in 3 multi-colored schemes. It’s enough to cover almost all types of business presentations. 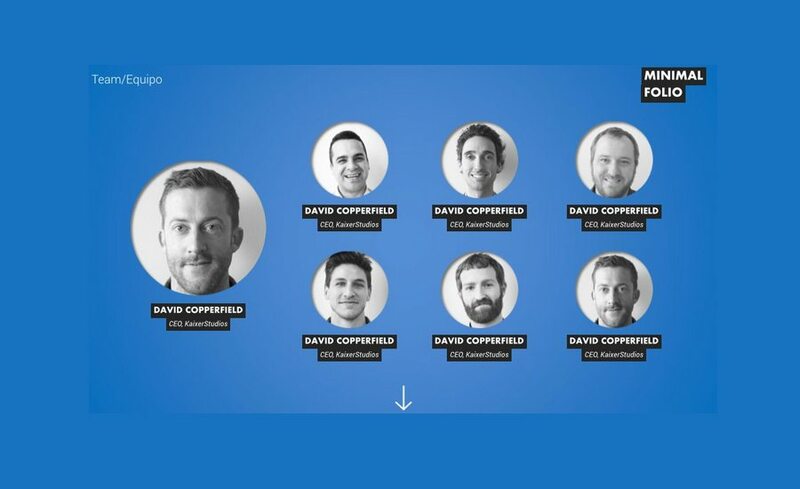 The unique vertical design of the slides is what makes this template different from the rest. 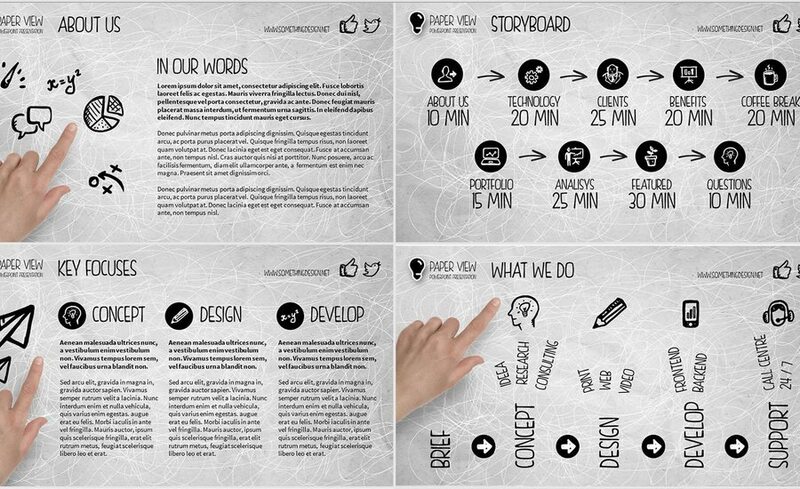 This template will allow you to show the creative side of your business through your presentations. 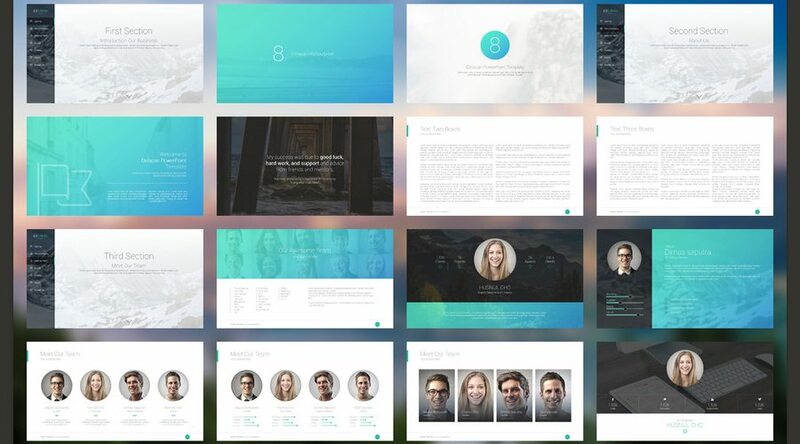 This beautiful template comes with over 8,000 slides in over 100 different colors. It also includes 500 free font icons, editable graphics, charts, vectors, and much more. Yet another template with a minimalist design. It packs more than 100 unique slides with image placeholders, photos, and much more. 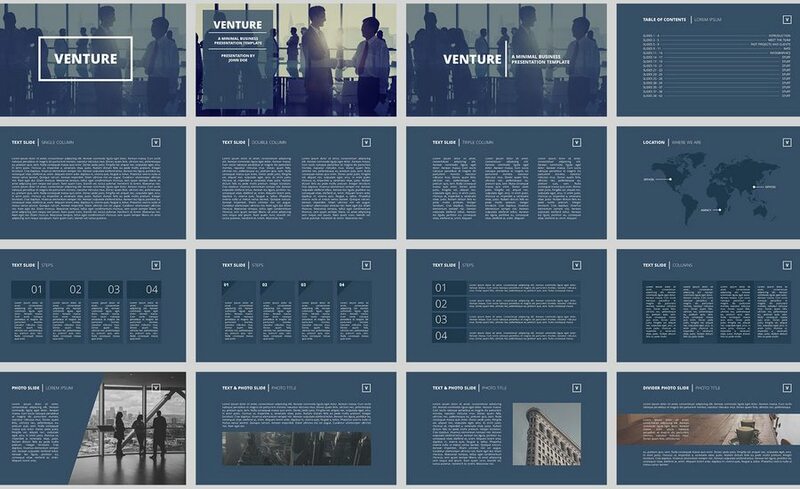 With 50 creatively designed slides, this Powerpoint template features a modern design that will fit in nicely with any creative agency or startup presentation. 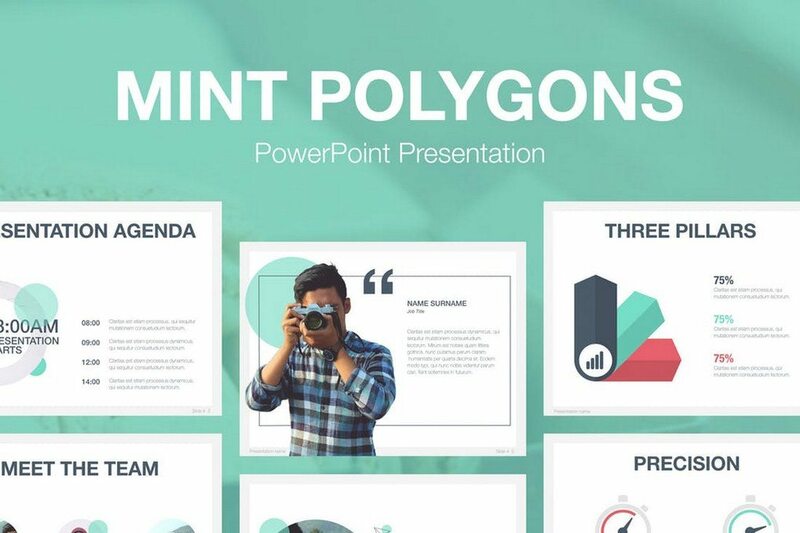 150 unique slides, unlimited color options, free icons, fonts, infographics, and vectors are only a few of the features of this Powerpoint template. A modern Powerpoint template with 50 unique slides. 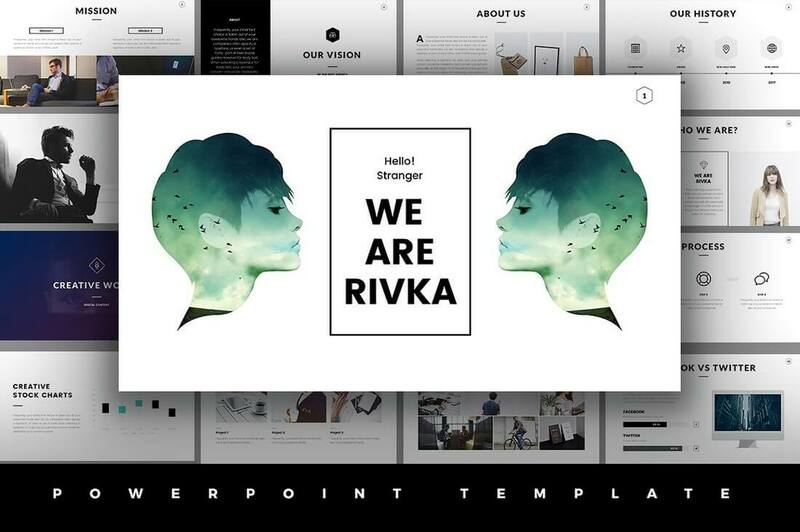 The template is ideal for fashion and luxury brand presentations. This template is suitable for all types of business presentations. It comes with 100 unique slides in 6 color schemes (total 1200 slides) and 300 vector icons. 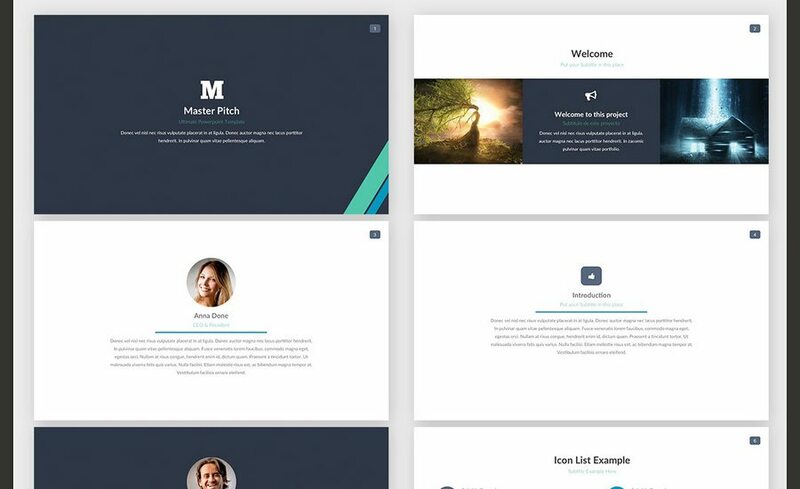 This stylishly designed template is perfect for in-house presentations and pitching startups. It comes with 45 animated slides. 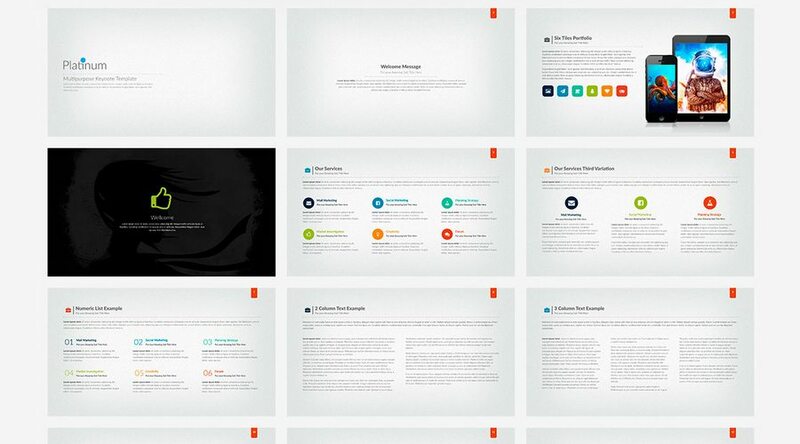 A very minimalist Powerpoint template that’s suitable for all types of creative presentations. It features 100 unique slides and 450 vector icons. 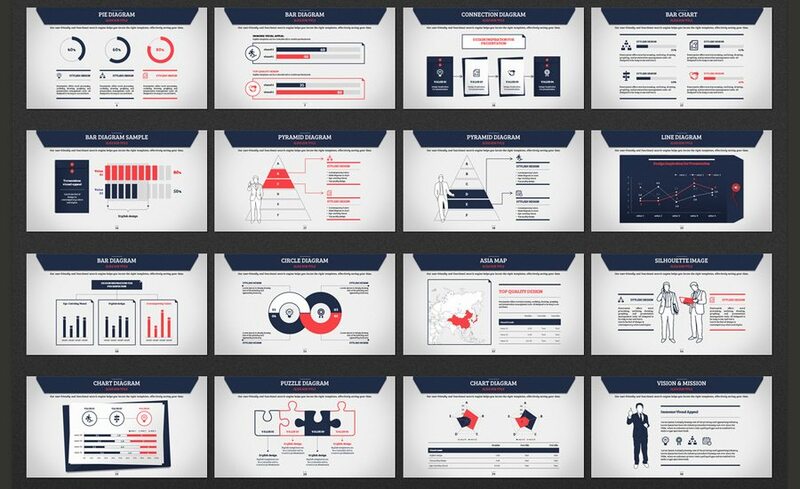 Xpress is a Powerpoint template filled with lots of graphics and illustrations. It’s great for pitching products and services. 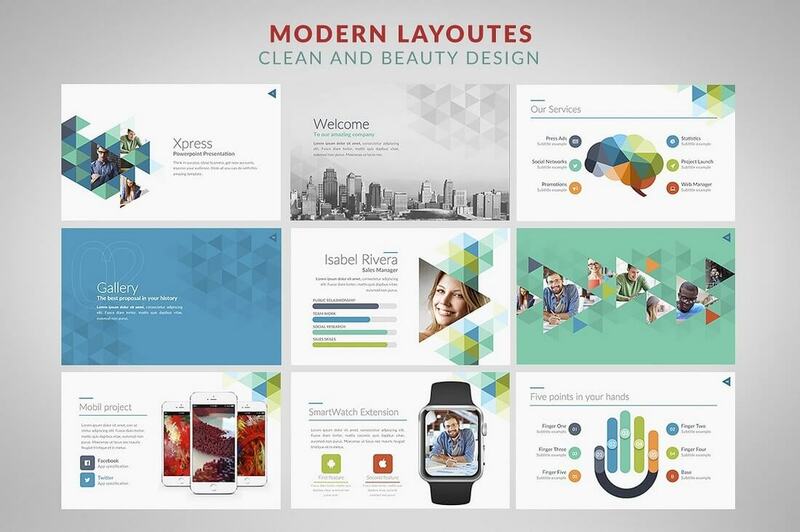 The template includes 60 unique slides in over 100 color options. 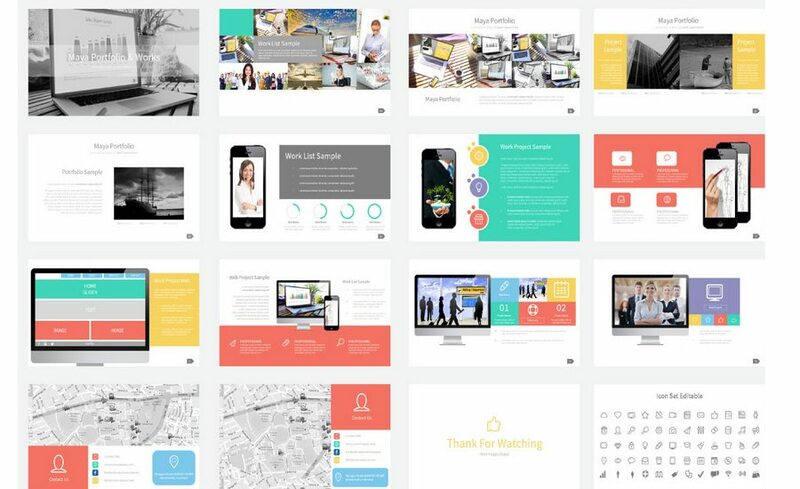 A professionally designed Powerpoint template for creatives, professionals, and startups. It comes with 50 creative slides, unlimited color options, vector graphics, and more. 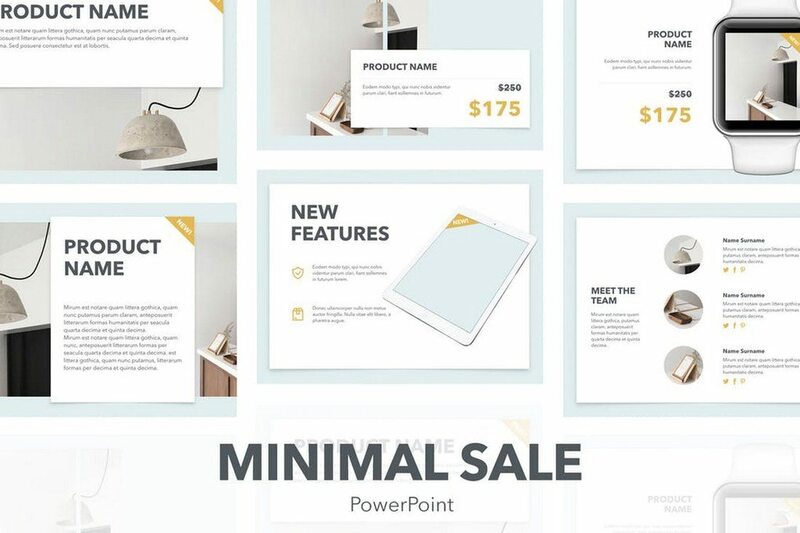 This is yet another big Powerpoint templates bundle that includes 12 unique presentation templates that feature attractive graphics, charts, icons, and much more. 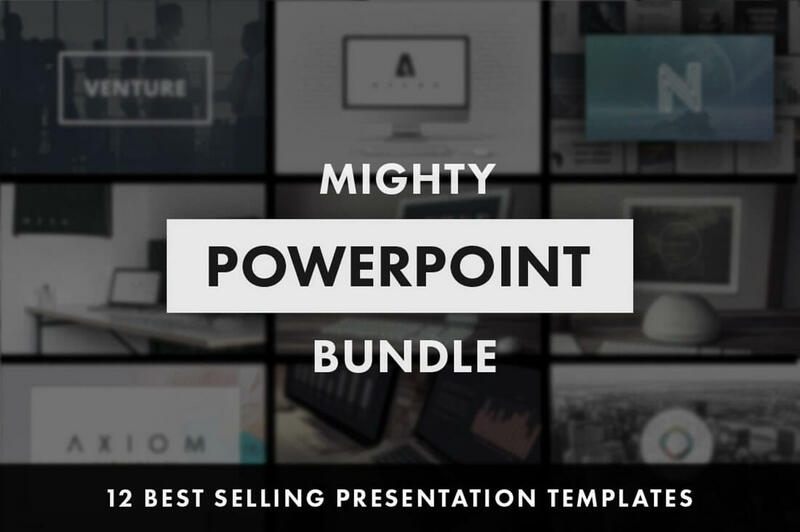 Increase your sales and close deals like never before with this massive PowerPoint Pack. 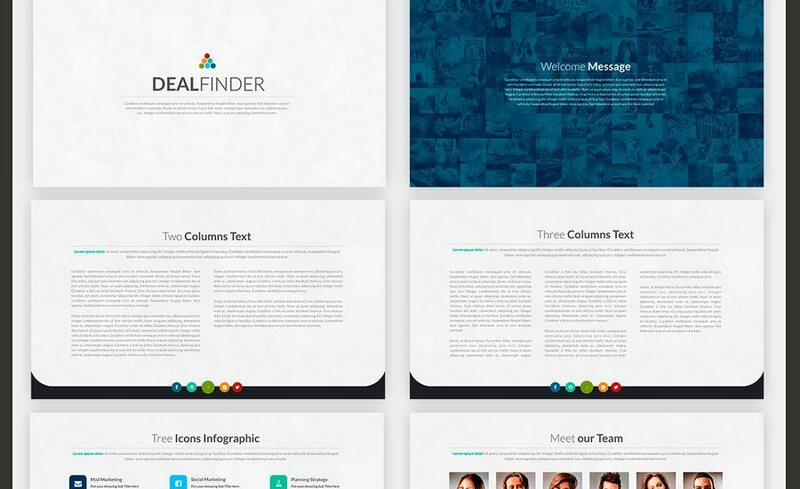 This pack contains 10 easy to edit, professional, clean and modern Presentation Templates. This pack contains 12,000+ HD slides, Master Slide Based , One click color changer, hand made charts, professional layouts ready to showcase your products, services, reports or any projects to your futures clients. 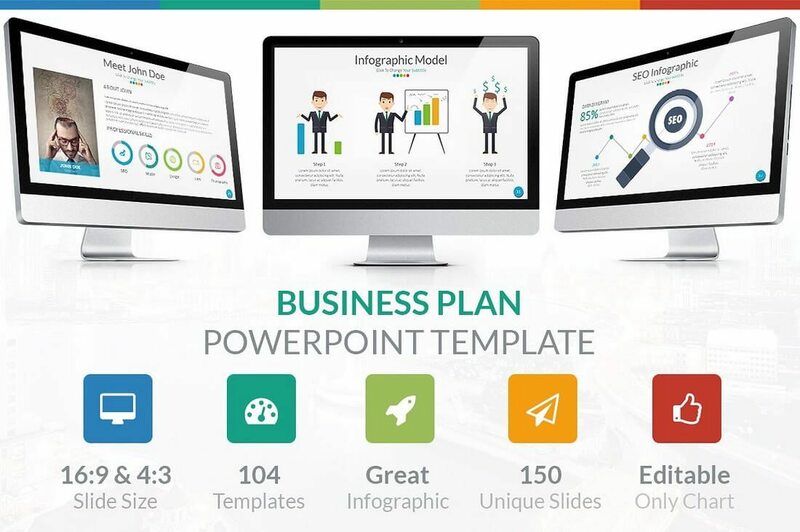 This beautiful pack contains 4,270 HD PowerPoint slides, hand made charts, professional layout that you can use to showcase your business or other work to your clients and affiliates. The deal finder pack contains 8,280 HD slides, One click color changer, hand made charts, professional layout and beautiful PowerPoint slides that you can use for a variety of business and personal purposes. 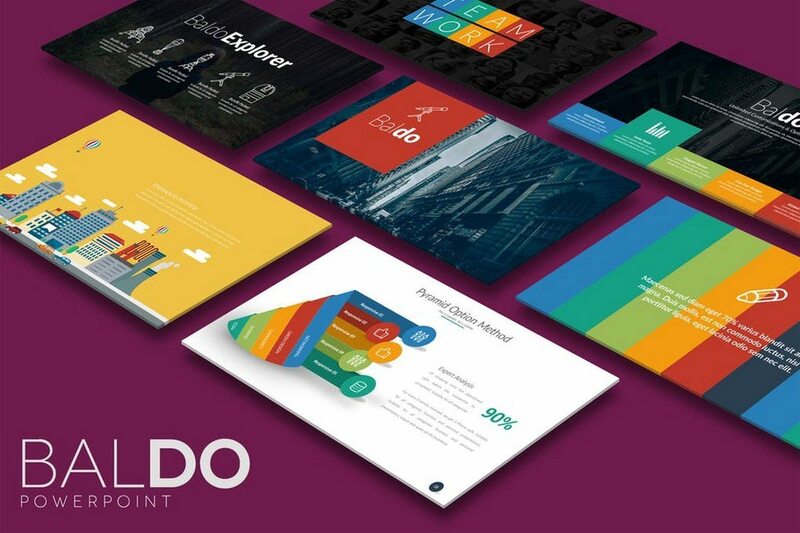 The Kilo pack contains clean, professionally designed HD powerPoint presentation slides. 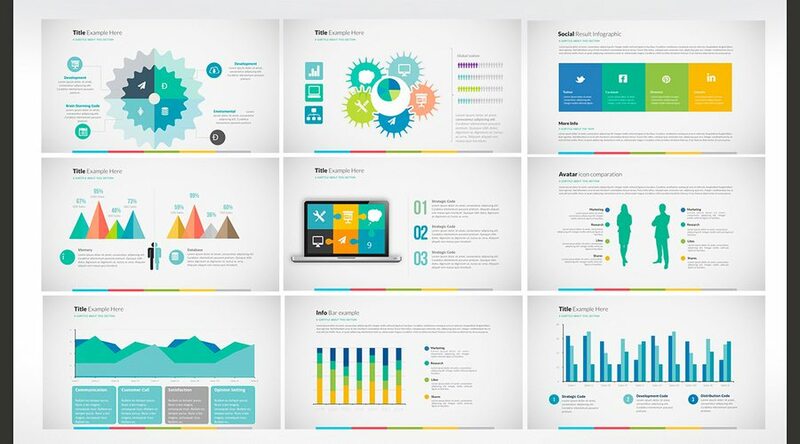 The pack is filled with unique infographics and professionally designed charts to aid you in your business presentations. SlidePro Powerpoint Presentation Template for you that you need unique, professional, clean, creative, simple presentation template. All slides designed using great style. All element easy to edit and you can easily change the color to match it with your personal or company brand. A minimal business presentation (in teal, black and blue options) that is a tad more serious and less colorful. Great for corporate presentations, business pitches and student projects. 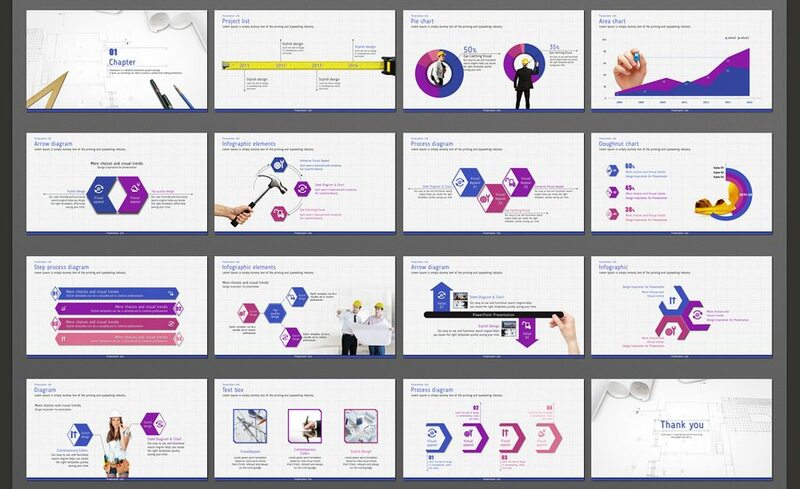 Maya Multipurpose Business PowerPoint Template is Impressive tool for presenting your company and your works. The current presentation enables its owners to work way faster and easier than ever before. If you are striving to present in a brilliant way and to amaze the audience with your work, you necessarily need this product. A very sleek PowerPoint Presentation template with 32 unique slides and 2 different color schemes. Vertex has minimal fade transitions, 16:9 aspect ratio, 1920×1080 resolution and includes .PPTX files. You can use it for a variety of business purposes. 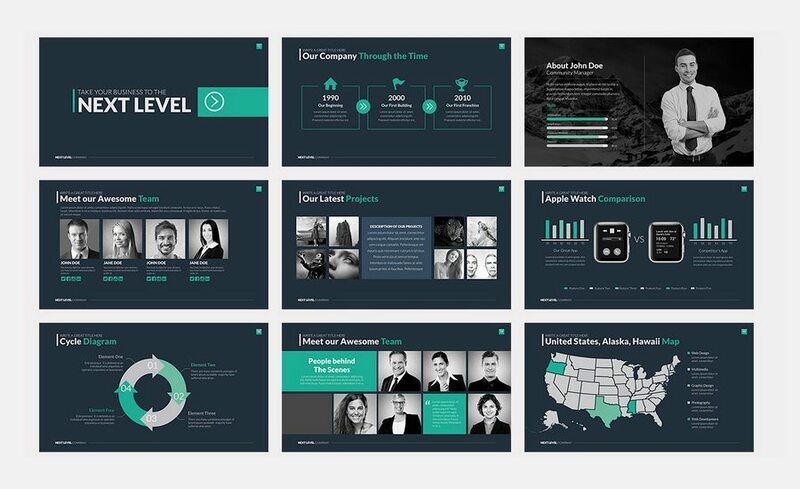 Omni is a creative pack that utilizes different colors to empower the presentation’s design work. It can be used for showcasing your business, personal or any other presentation to your clients. The pack contains more than 50 unique slides with dark and light color versions. 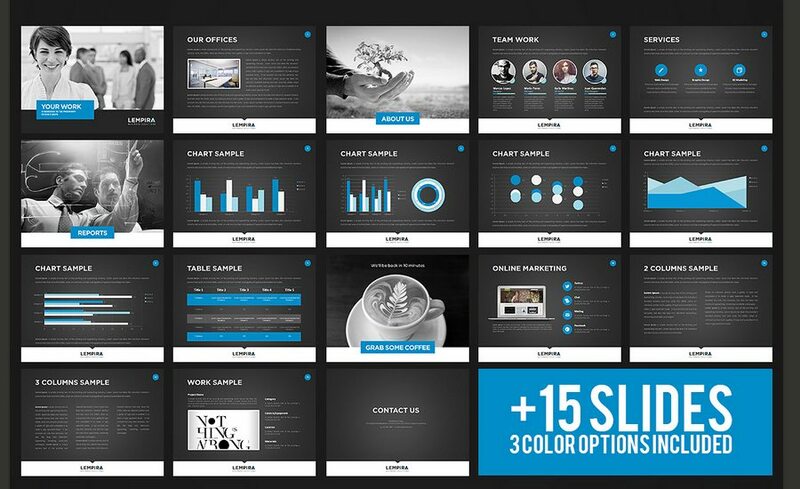 Use this PowerPoint presentation to showcase your portfolio in the best possible manner. The pack contains 50+ Slides, 16:9 Screen Ratio, 1920×1080 Full HD screens for large scale display of your presentations over projectors. 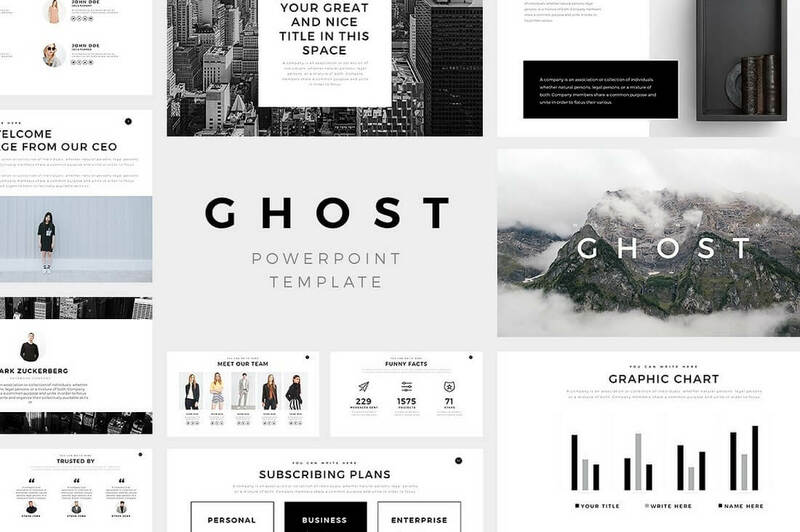 Mesa is an elegant, minimalist PowerPoint template. It includes 50+ unique slides and two color versions. Has minimal fade transitions, 16:9 aspect ratio, 1920×1080 resolution and includes .PPTX files. The black and white color scheme also makes it great for gray scale printing. Named after iconic fashion designer Yves Saint Laurent, Yves is an elegant PowerPoint presentation for when you’re in need of something chic and glamorous. Monica Multipurpose Business PowerPoint Template is Impressive tool for presenting your company and your works. The current presentation enables its owners to work way faster and easier than ever before. If you are striving to present in a brilliant way and to amaze the audience with your work, you necessarily need this product. 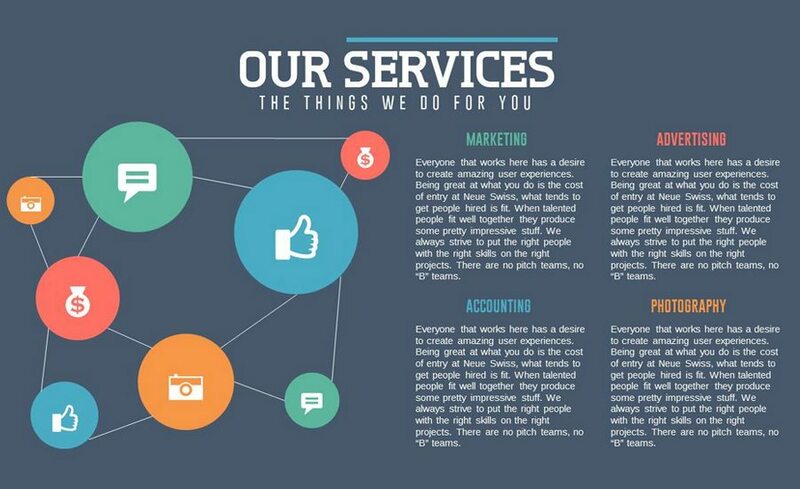 A modern and clean presentation special for an Agency or any type of business. It’s very easy to change colors, text, and photos and replace them with your own content. 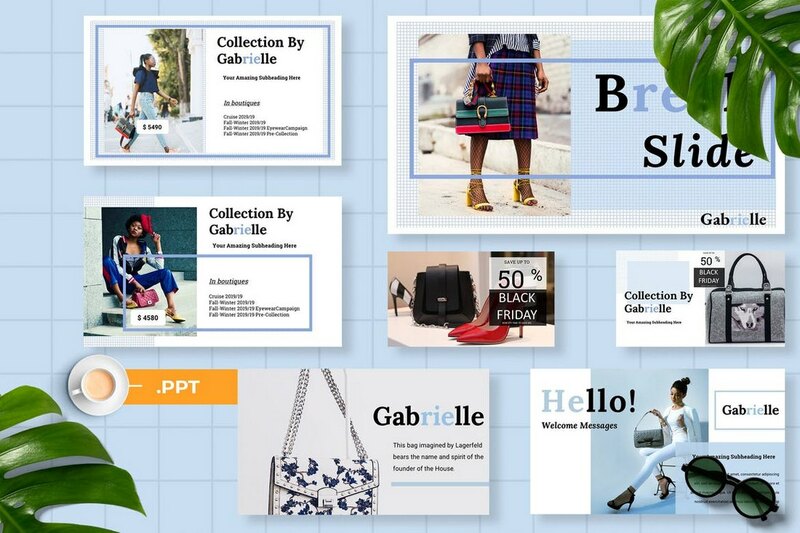 A unique PowerPoint presentation for fashion followers and businesses. You can use this template to present your fashion brand or online clothes shop. If you are looking for an attractive, eye-catching, professional looking and stylish presentation template, you will find this presentation very fulfilling. 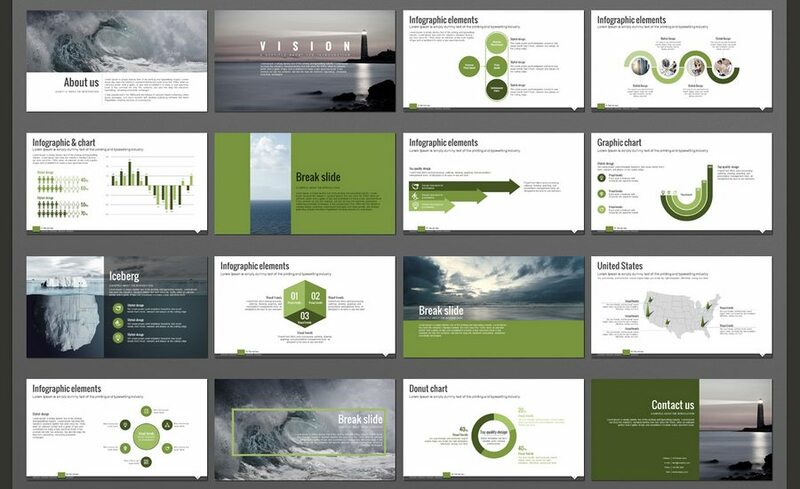 This Wave presentation template contains various sources to make your presentation professional and effective. Various types of infographic, charts and diagrams included in the template will be useful to visualize your data and information. All elements, colors, shapes, charts and diagrams can easily be modified to meet your needs: charts and diagrams are linked to excel enabling you to modify them conveniently. The temples comes in 3 different color themes and 2 different sizes providing you various options to choose from. 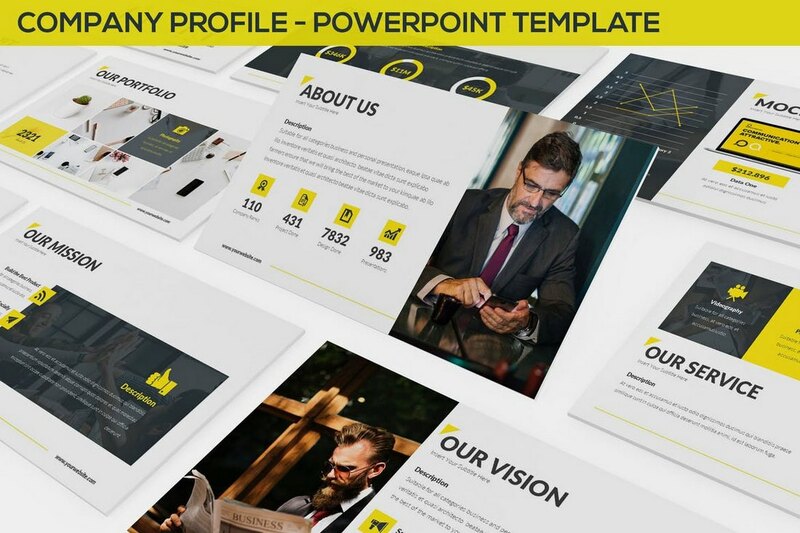 Swiss Style PowerPoint Template for your Presentation business or personal use, such a creative industry, Technology, Finance, IT, Networking, etc. 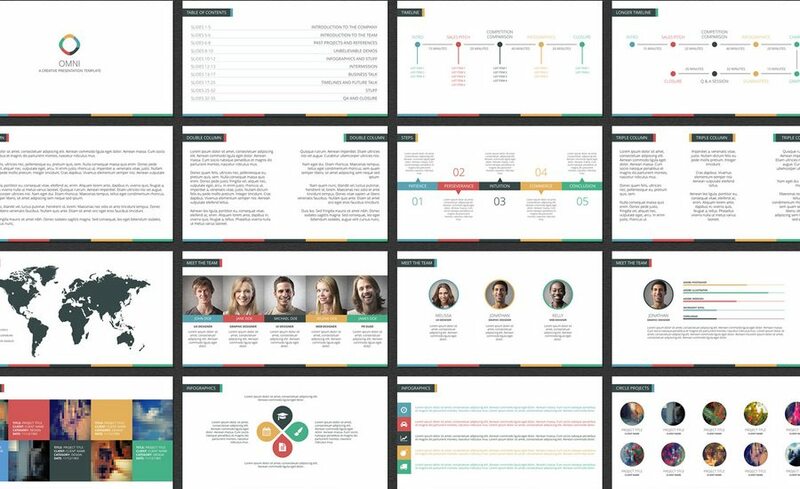 Creatic has 45 Custom Slides that consist from Handmade Infographic, Chart, Process,, SWOT Analysis, Portfolio, Gallery, Maps, General Information, Meet The Team, and another things that useful for your presentation. All elements are editable from a shape to colors no need another software to edit it. 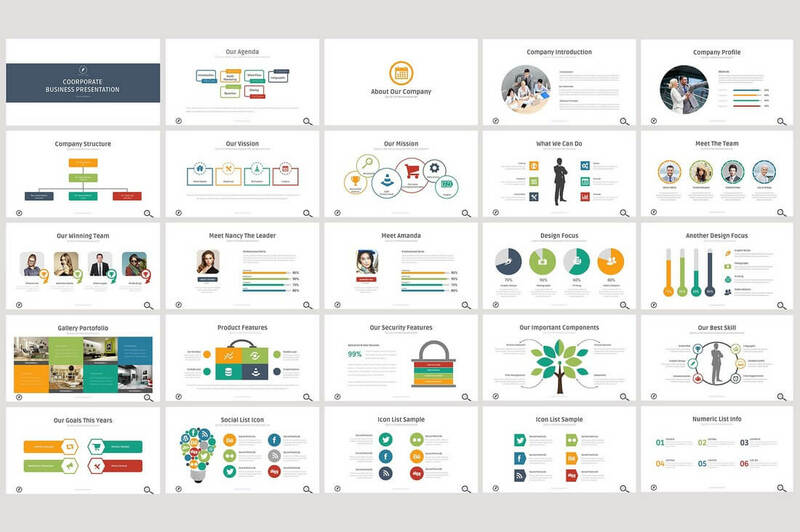 Ideas conference presentation template is a illustrated image based presentation template. It contains various types of slides for you to best utilize for your professional looking presentation. It contains various types of infographics, charts and diagrams that can be used to visualize your data, data analysis results, and other information. All elements, colors, shapes and charts can be easily modified to meet your needs: all charts are linked to excel enabling you to modify them conveniently. The temples comes in 3 different color themes and 2 different sizes providing you various options to choose from. If you need to make a presentation and cover a topic related to intoxication, drugs, medical consulting, treatment and etc., you will find this Intoxication presentation template very useful and might think that this is created just for you. With this presentation template, you will be able to talk about various necessary areas of subjects during your presentation. Various types of charts, graphs, diagrams and etc. are included in a way that can be easily utilized meeting your needs for your own presentation, and all elements, colors, shapes and charts can always be easily modified and edited. 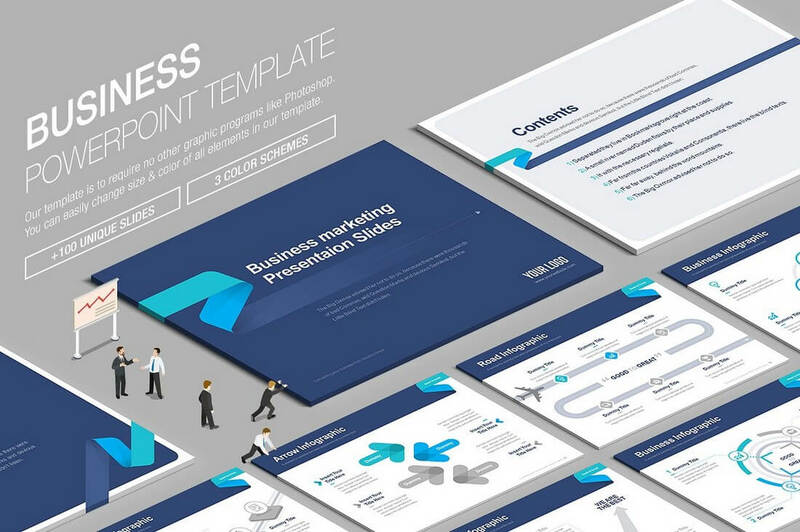 Business Plan presentation template is designed based on the envelope concept. It’s very neat and contains various types of diagrams that you can utilize to make your presentation more effective and attractive. All elements, colors, shapes and charts can be easily modified to meet your needs: all charts are linked to excel enabling you to modify them conveniently. The template comes in 3 different color themes and 2 different sizes providing you various options to choose from. 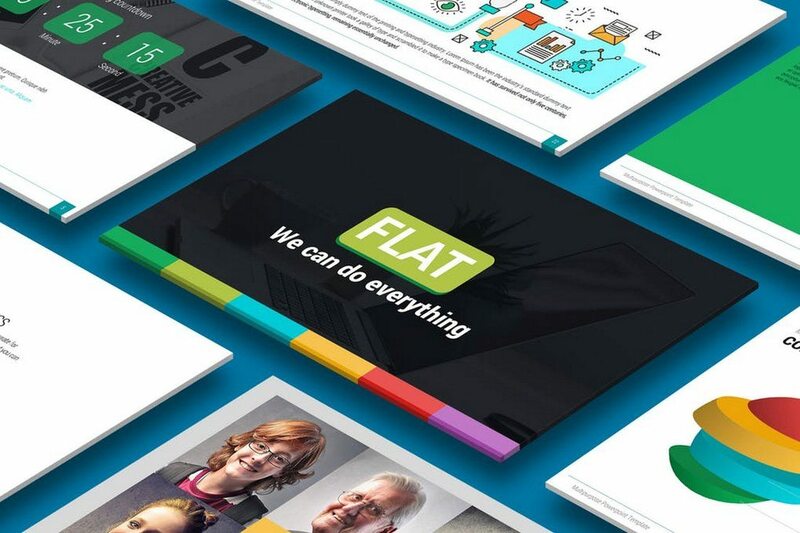 Flaty is a flat modern style PowerPoint Presentation Template. You can easily customize the slides to mold the presentation for your needs. We have already made 3 color schemes for you to choose from, as well as a dark version. All slides are fully editable. Easy to change colors, text, photos etc. 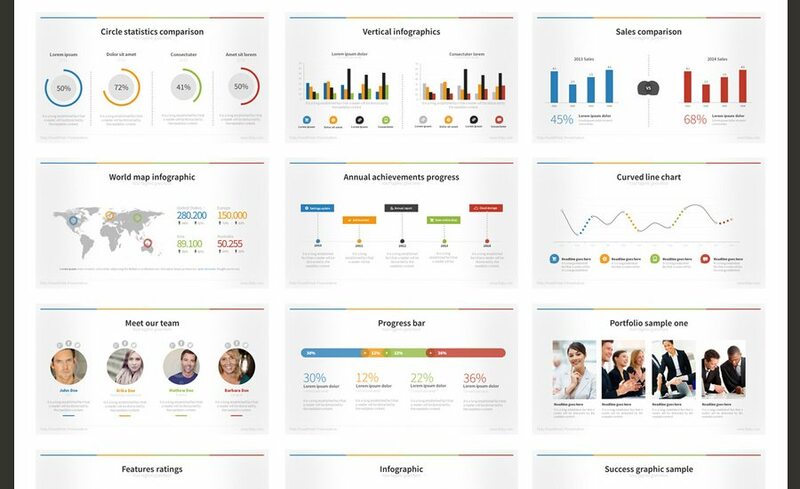 Benchmarking PowerPoint Template is a new, fresh, modern, clean, professional, ready-to-go presentation. This presentation includes 350+ icons as shapes. 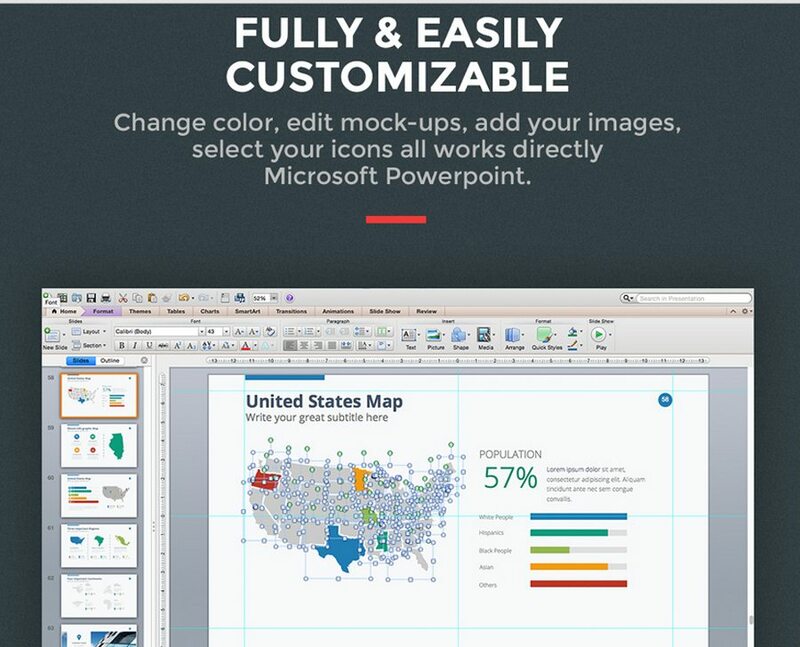 You can change color and size directly in PowerPoint and does not requires Photoshop. 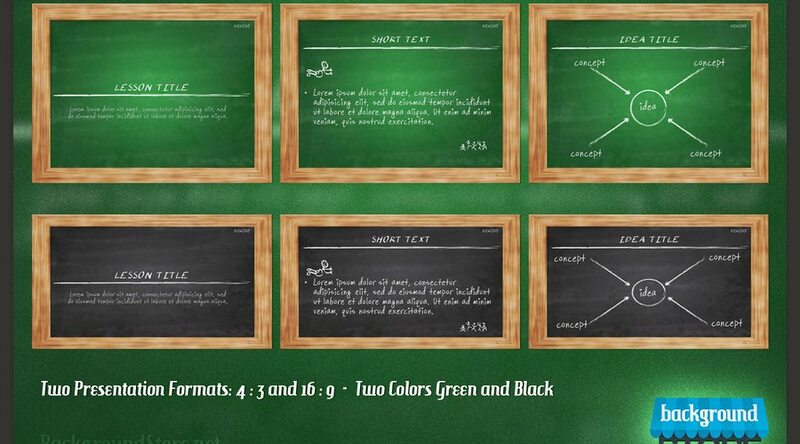 Add a touch of hand made elegance to your deck with the Aquarelle PowerPoint Presentation Template. This pack contains 4 gorgeous versions, featuring hand painted watercolor graphics in stunning color combinations. 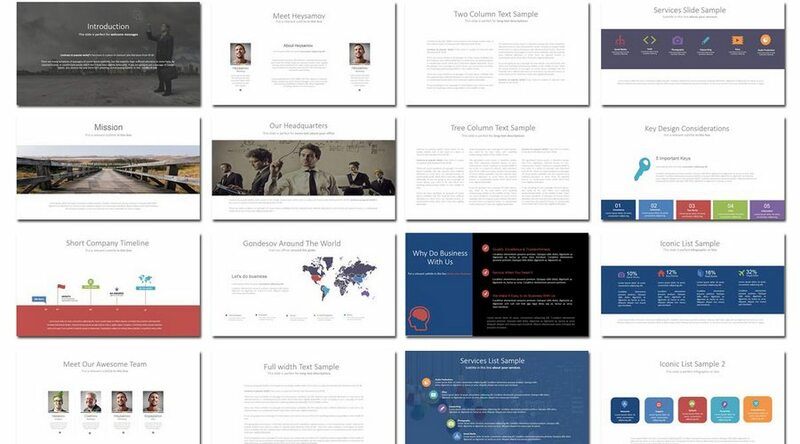 In addition to live presentations, these templates are great for digital eBooks, slidedocs, business decks, class reports and creative agency presentations. 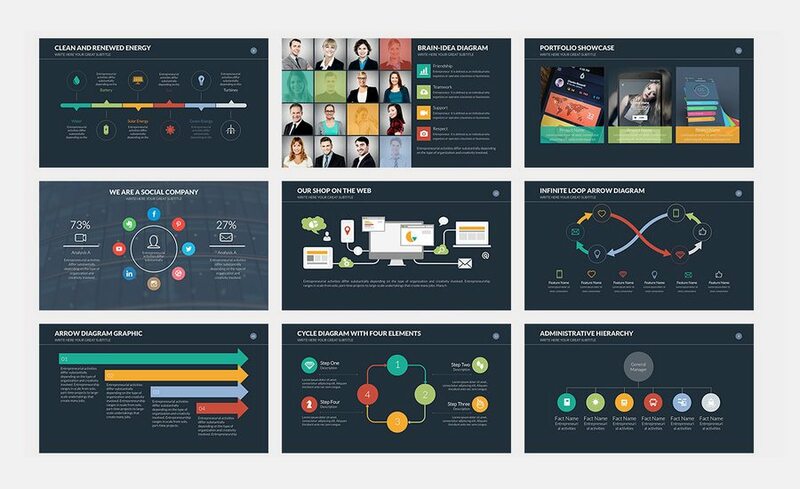 Take your business to the Next Level with this Trendy and Modern PowerPoint Template. 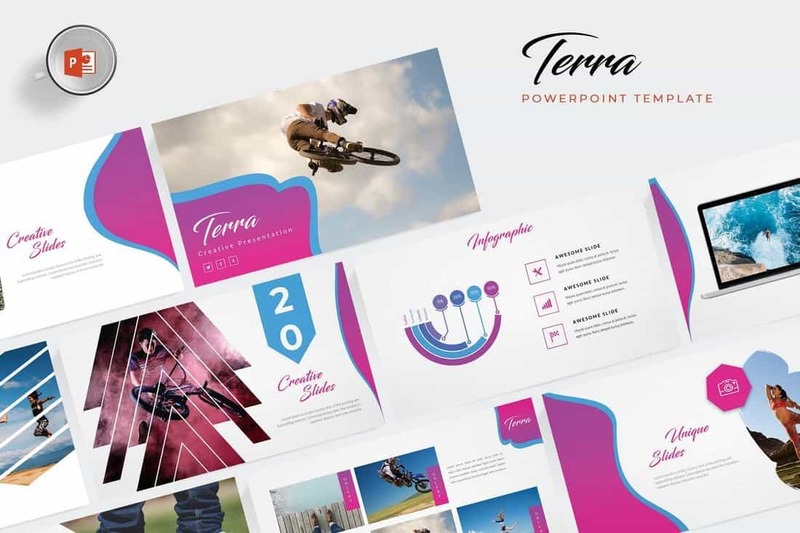 Whether you present this to a group of people or if you will send it via email, this pack of PowerPoint Slides will fit all your needs. With tons of elements: Infographics, Editable Charts, Portfolio Showcase, Maps, diagrams, flowcharts, tables, Next Level is a quality product to invest your money in. Engage PowerPoint Presentation Template has been created especially with the needs of presenters, users and viewers in mind. Universally, most business presentations include content based on: Who, What, How, Where and Why. Engage has been intentionally divided into these main sections to give all of your presentations a well-structured yet natural flow. 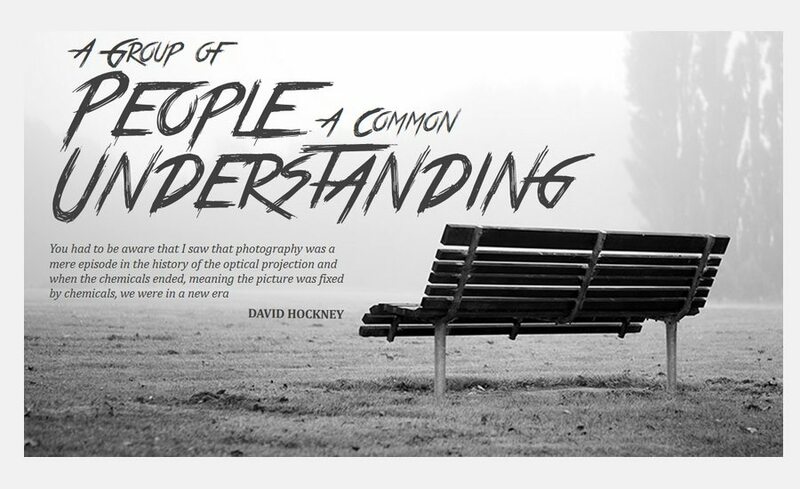 The unique photography PowerPoint presentation will help you in presenting your portfolio to your clients and alike in the best possible manner. The pack contains over 30 slides with full editable features. 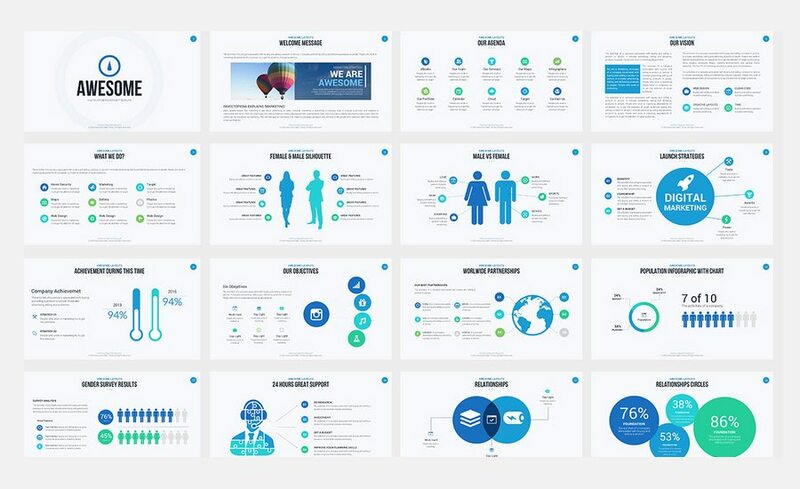 Perspective presentation template contains various types of infographics, charts and diagrams that you can use to visualize your data, data analysis results and etc. This template contains photo based backgrounds so it’s more eye-catching. All elements, colors, shapes and charts can be easily modified to meet your needs: all charts are linked to excel enabling you to modify them conveniently. The template comes in 3 different color themes and 2 different sizes providing you various options to choose from. 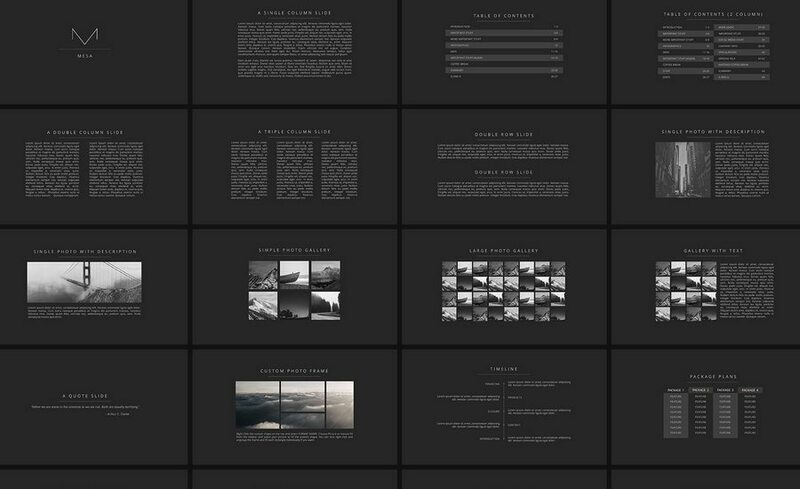 The Minimal Folio Keynote Presentation contains fully editable 50+ Slides. It comes with 4 different color which are green, blue, maroon, orange. The Laukpauk is a $12 presentation pack that contains 50+ Slides and come in 4 Color Schemes (with dark & light background). The slides specifications include 16:9 Screen Ratio, 1920×1080 Full HD resolution with modern layouts based on master slide. Awesome Ultimate PowerPoint Template is a Professional, Clean and Creative Presentation to show your business. All elements are fully editable from a shape to colors. 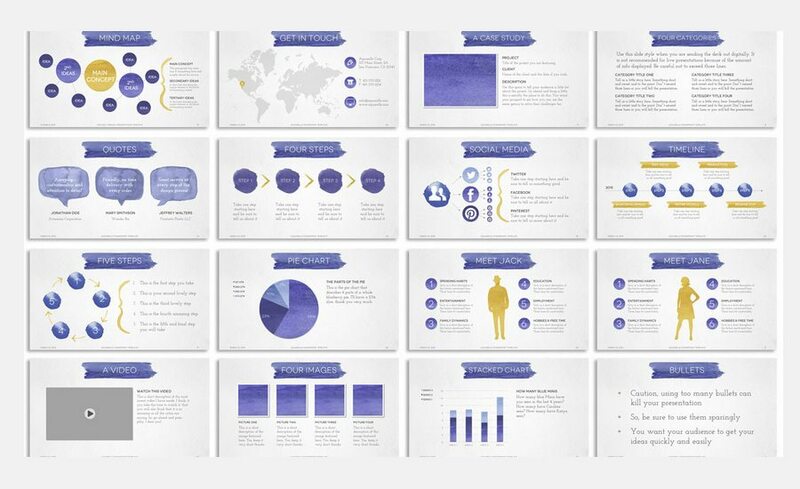 Impress your audience with this awesome PowerPoint Presentation Template. 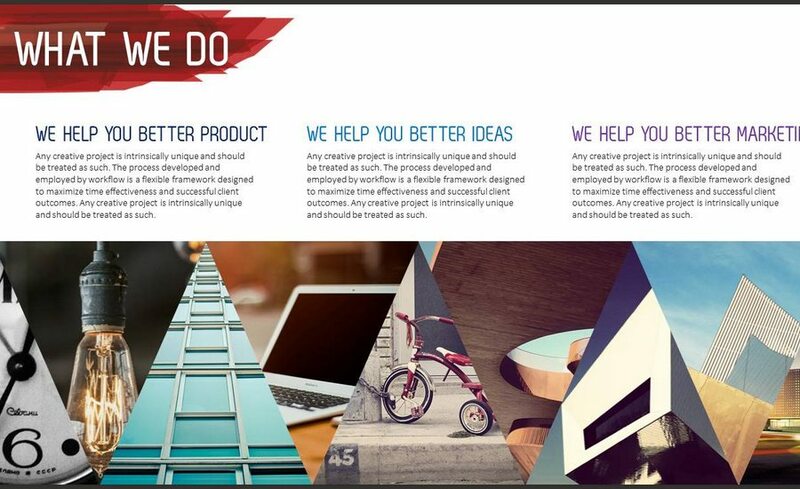 Innovation was designed with a great selection of slides fully editable, perfect to rock your next presentation. 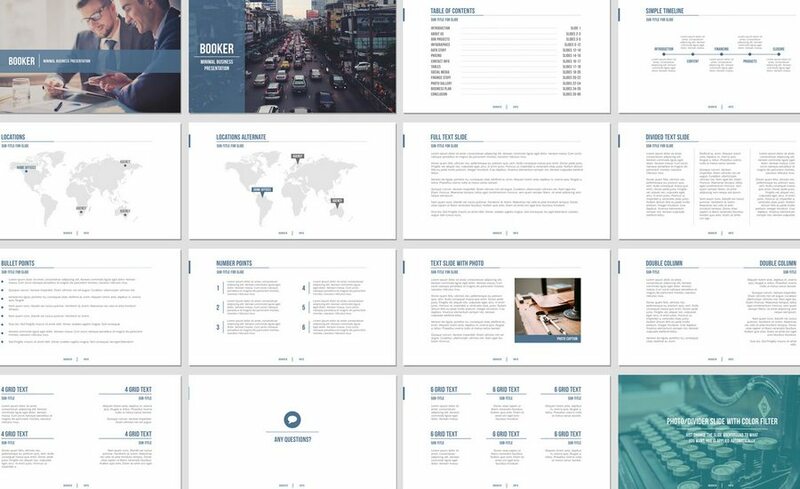 The Report Presentation Template has 28 files with 150 unique slides. In addition, it contains 14 total color schemes in 2 background variations (dark and light color background). A modern, handcrafted and creative presentation, specially designed for a Agency/Graphic Design Artist/ or any type of business. Fully editable files with easy to change colors, text and photos. 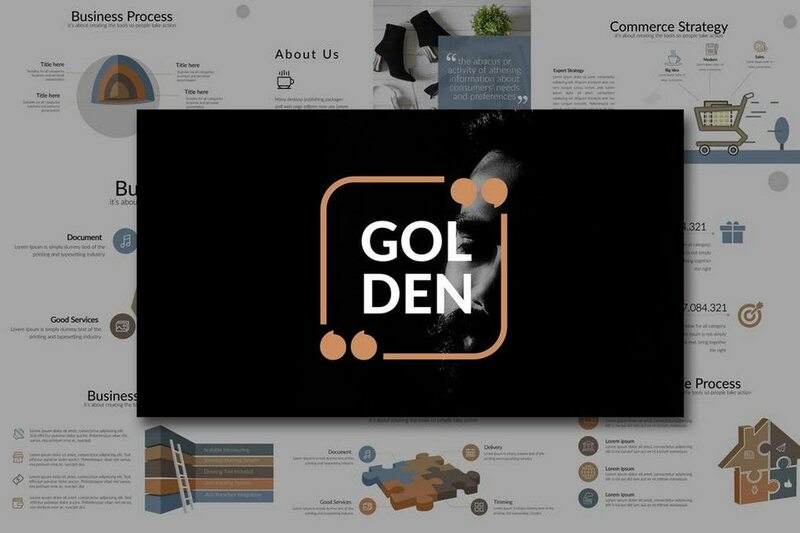 If you’d prefer a presentation with simple and neat designs rather than complicated and heavy designs, check this Modern Business presentation template. This template is designed with concise and simple layout and understated colors. The concise and simple compositions will help your presentation contents stand out, so it will be good for text based, detailed information based presentations. You will be able to deliver the information in a professional way by using the various types of diagrams, charts and infographics that can be easily modified and edited. The temple comes in 3 different color themes and 2 different sizes providing you various options to choose from. 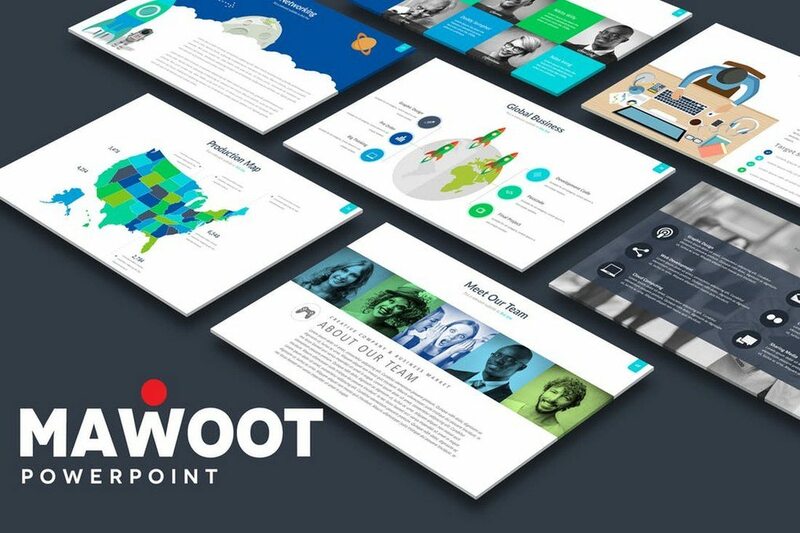 A clean, crisp design with flat elements that you can use to showcase your work through brilliant presentations. The Power note pack contains more than 30 fully editable slides. 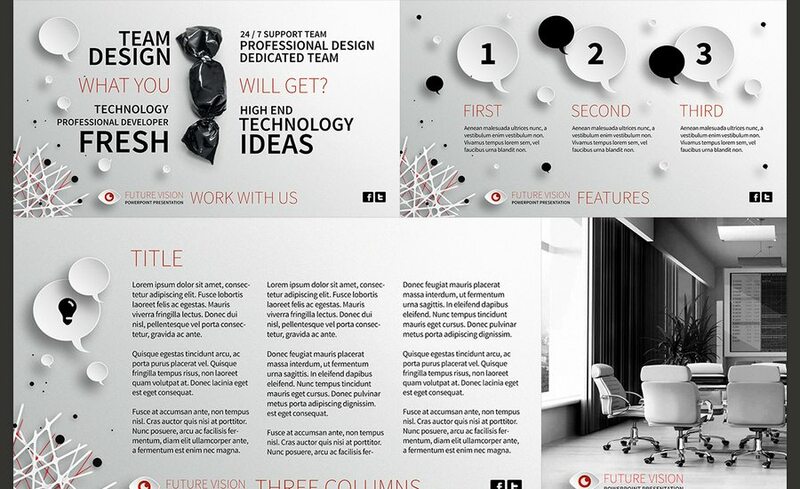 The future vision template comes with a unique animated and non-animated slides combination. The 28 slides pack contains fully editable, HD versions that will give a unique modern touch to your presentations. A minimal business presentation in blue, black and reverse blue options. Great for corporate presentations, business pitches and student projects. Includes everything you see except for the photo on the cover and people portraits. 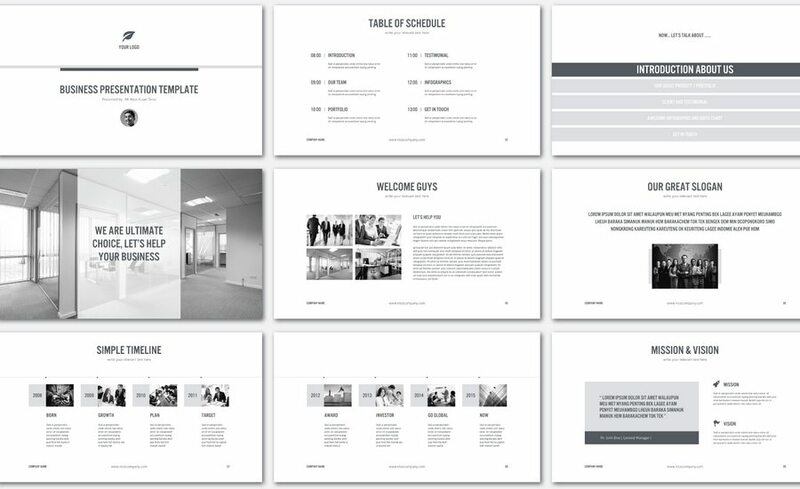 Blueprint presentation template contains images(photos) that people in the architectural or architecture related businesses can efficiently use. It contains various types of infographics, charts and diagrams that you can use to visualize your data and information. All elements, colors, shapes and charts can be easily modified to meet your needs: all charts are linked to excel enabling you to modify them conveniently. The template comes in 3 different color themes and 2 different sizes providing you various options to choose from. The Paper PpowerPoint temlplate is an ideal presentation platform that will add tons of creativity to your work. You can use this beautiful template for a mere $14. It contains organized PowerPoint and Photoshop versions and has 50+ slides. Show your creative style with the Savvy Collection PowerPoint Presentation Template Bundle, a gorgeous set including Aquarelle, Sparkle and Chalkboard – three stunning, easily customizable PPT presentation templates. 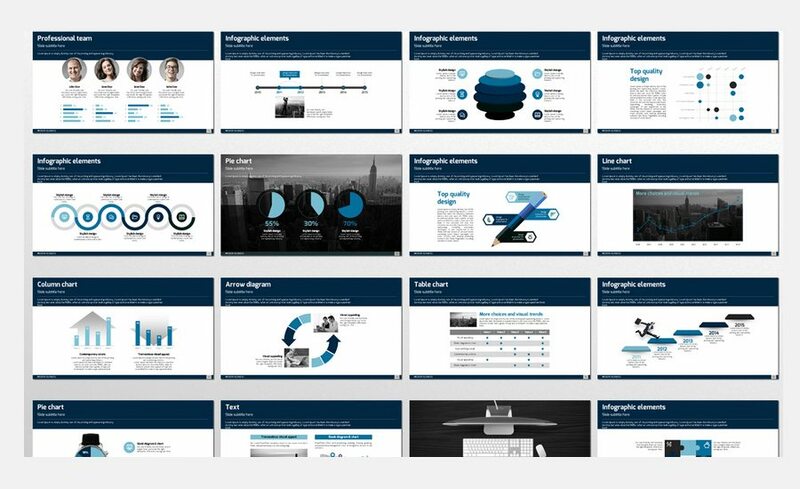 Great for eBooks, business decks, slidedocs and creative presentations, these professionally designed PowerPoint templates are fully customizable and simple to use. 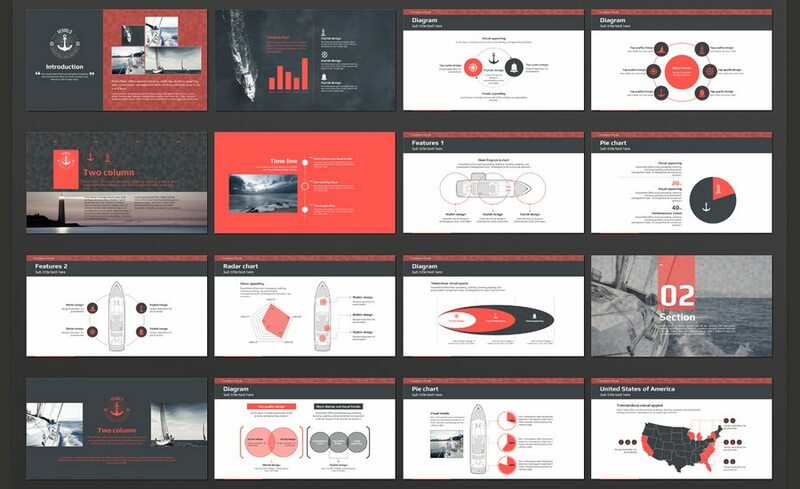 This Sailing presentation template is designed for those who are looking for templates that fulfills their specific industrial needs. If you need presentation templates for your specific industry or business, templates containing industrial related images or photos, and etc., you will love this presentation template. Various types of charts, graphs, diagrams and etc. are included in a way that can be easily utilized meeting your needs for your own presentation, and all elements, colors, shapes and charts can always be easily modified and edited. We are offering you various color and size variations to help you make your presentation more suitable for the situation and environment and etc. 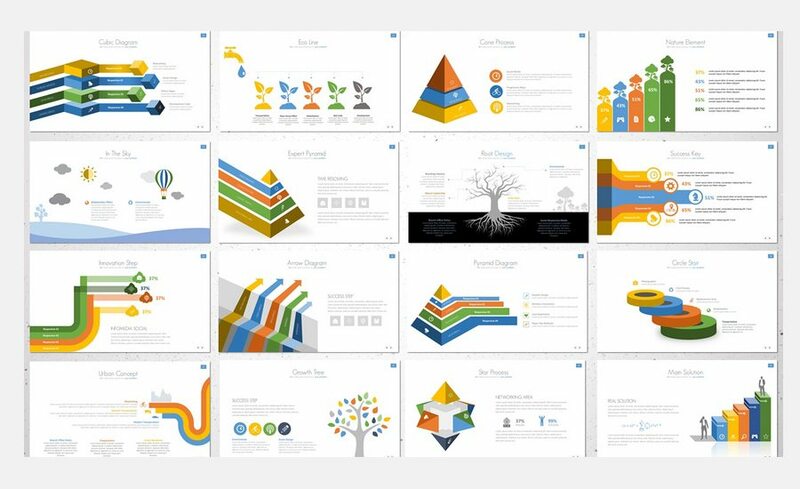 An extremely creative set of 45+ slides PowerPoint presentations that will revolutionize your business presentations. The current presentation enables its owners to work way faster and easier than ever before. If you are striving to present in a brilliant way and to amaze the audience with your work, you necessarily need this product. If you were a manager, who wants to present the potential of a company, a lecturer who is eager to attract attention, or a student who wants to present a report – don’t hesitate, this huge package is developed just for you! 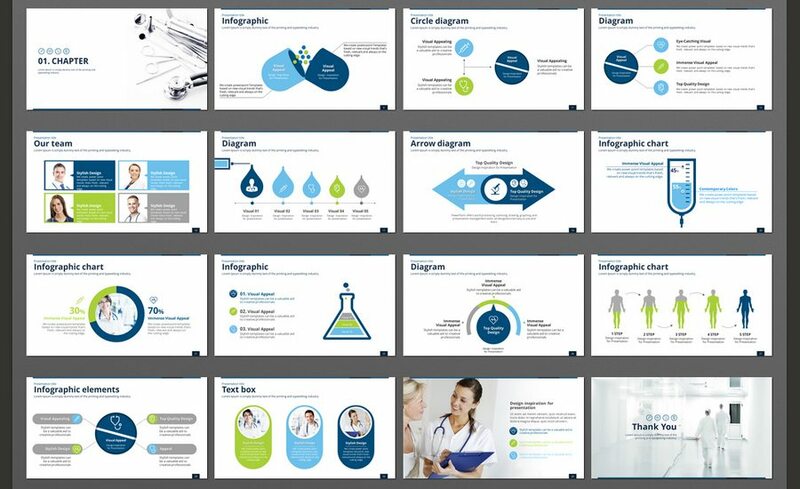 This Medical Team presentation template is designed for those who are looking for templates that contains medical industry related slides. 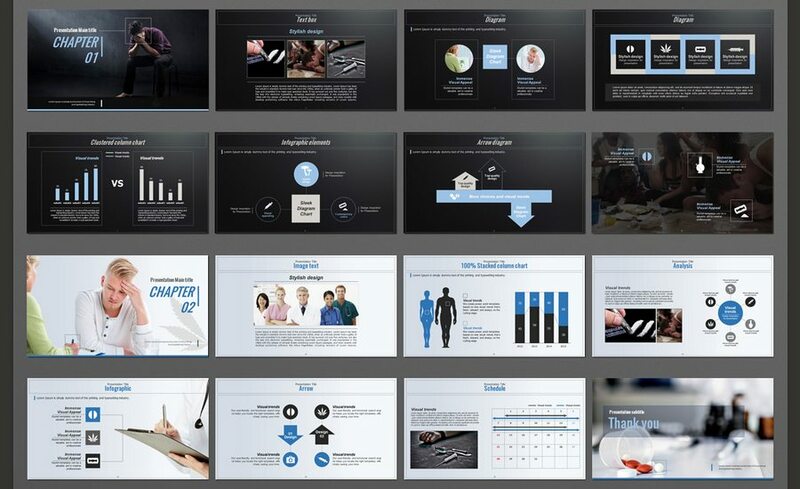 If you need presentation templates for medical industry or business, templates containing medical industry related images or photos, diagrams and etc., you will love this presentation template. Various types of charts, graphs, diagrams and etc. are included in a way that can be easily utilized meeting your needs for your own presentation, and all elements, colors, shapes and charts can always be easily modified and edited. We are offering you various color and size variations to help you make your presentation more suitable for the situation and environment and etc. 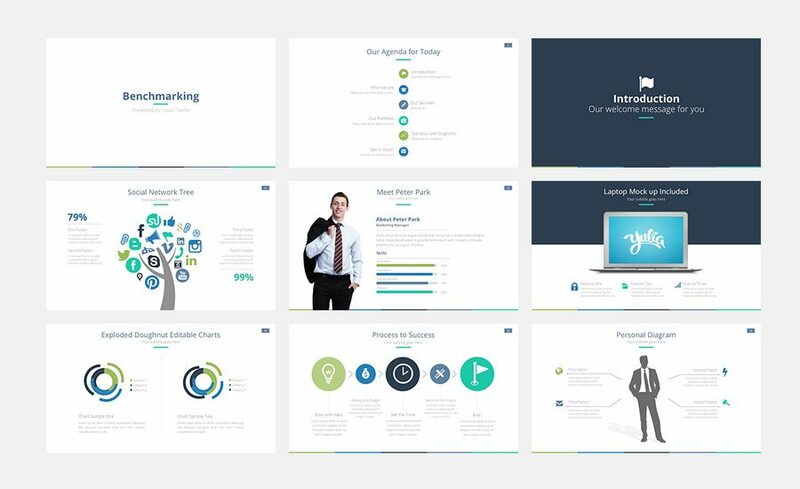 A Professional, Clean and Creative PowerPoint Template to show your business. All elements are fully editable from a shape to colors. Some of the features of this bundle include 57 awesome slides, full HD, 300 font awesome icons, handmade Infographics and custom animated slides. 6,360 HD slides,Uniques infographics, hand made charts, professional layoutes ready to show your products, services, reports or any projects to your futures clients. A modern, handcrafted and creative presentation, special for a Agency/Graphic Design Artist. Easy to change colors, text, photos. Fully editable. and 4 Png Elements that you can use in your presentation. Africa a clean, scalable and multipurpose PowerPoint Template to present your business to potentials clients in a elegant way. Africa has 42 files (PPT and PPTX) & 120 Unique Slides each file of content (portfolios, general information, handmade infographics, data charts, section breaks, maps, tables, timeline etc. ), many layouts options, animations and more. Please be sure to install the fonts before open the presentation. 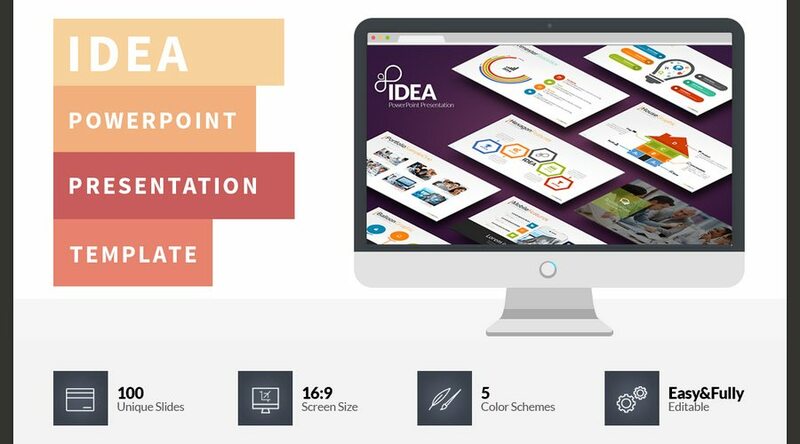 Idea PowerPoint presentation keeps the line of flat design and brings out new ideas and more custom infographics to use in your meetings. If it’s about a business meeting or just a personal presentation, Idea fits your needs, having a modern and attractive look to impress your clients. 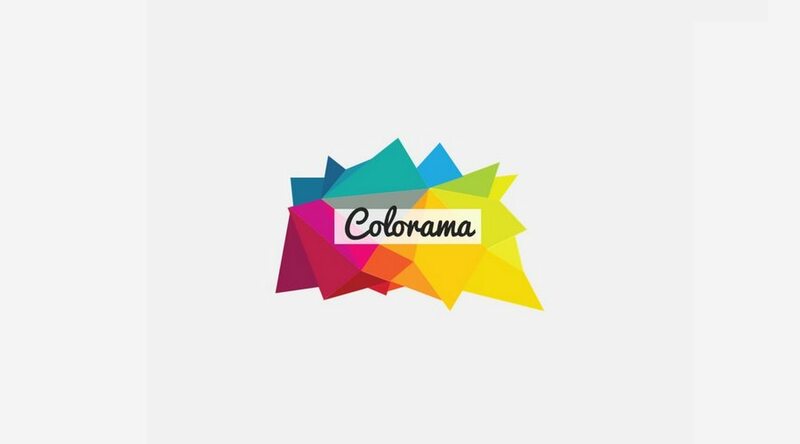 Colorama pack contains amazing set of free fonts in combination with colorful and stylish slides. Fully editable files with hundreds of icons. 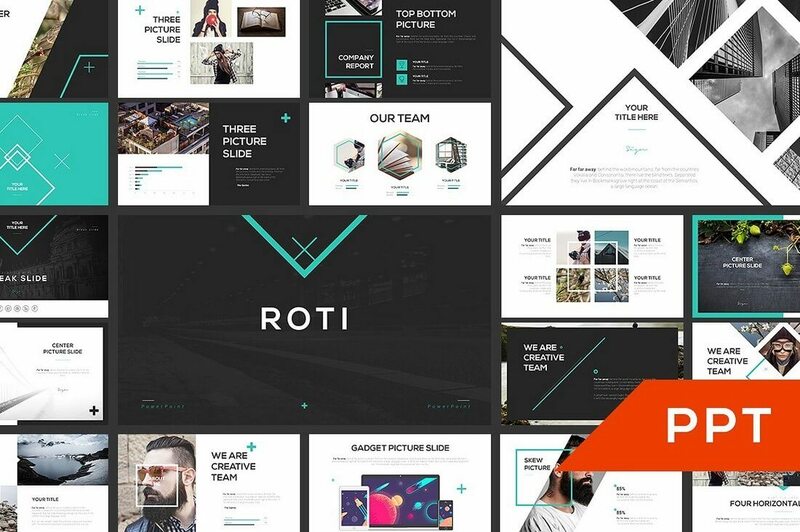 Rhythms is the ultimate multipurpose PowerPoint template that can fit to any topic you are presenting. Attractive is the keyword. Rhythms template provide you with unlimited of carefully handmade crafted infographics where you can fully edit inside PowerPoint to match your content. Branding PowerPoint Template is a Professional, Clean and Creative Presentation to show your business. All elements are fully editable from a shape to colors. 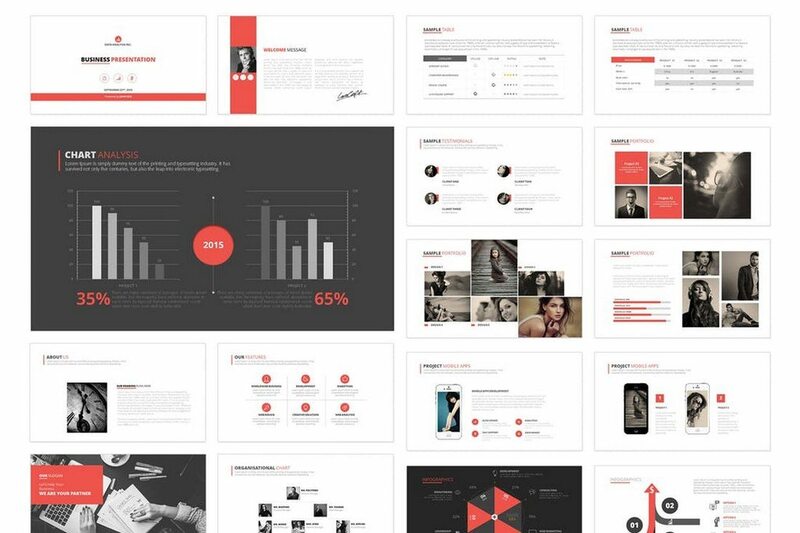 Captivate your audience with this awesome PowerPoint Presentation Template. 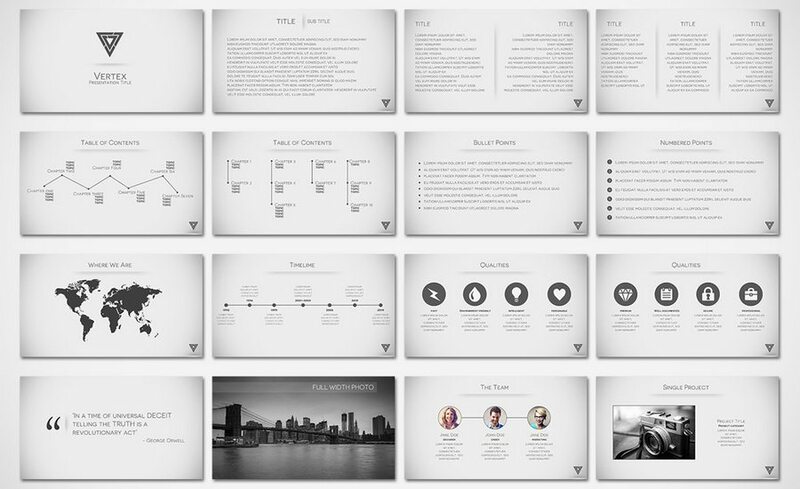 Impresario was designed with a great selection of slides fully editable, perfect to rock your next presentation. 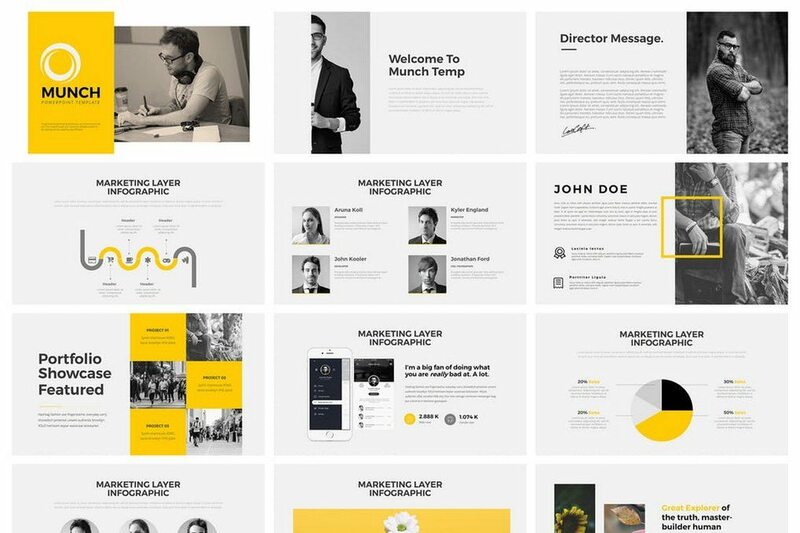 Deboe a clean, scalable and multipurpose PowerPoint Template to present your business to potentials clients in a elegant way, Deboe has 6 files (PPT and PPTX) & 91 Unique Slides each file of content(portfolios, general information, handmade infographics, data charts, section breaks, maps, tables, timeline etc. 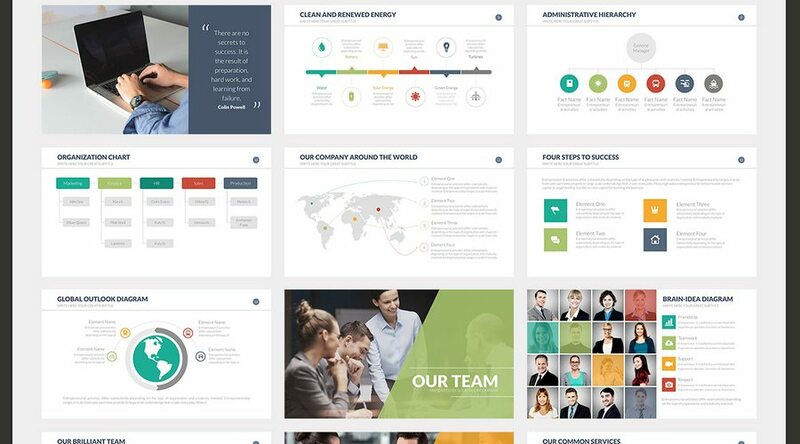 Titipan is a clean, scalable and multipurpose PowerPoint Template to present your business to potentials clients in an elegant way. It has 4 files (PPT and PPTX) & 72 Unique Slides each file of content (portfolios, general information, handmade infographics, data charts, section breaks, maps, tables, timeline etc). 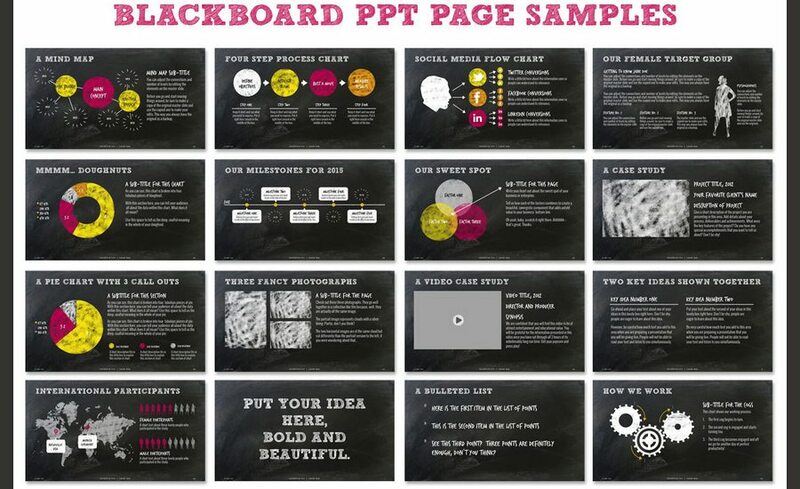 The templates in this bundle look brilliant and are really easy to use. They’ll definitely help you take your presentations to the next level, and save you a ton of time.